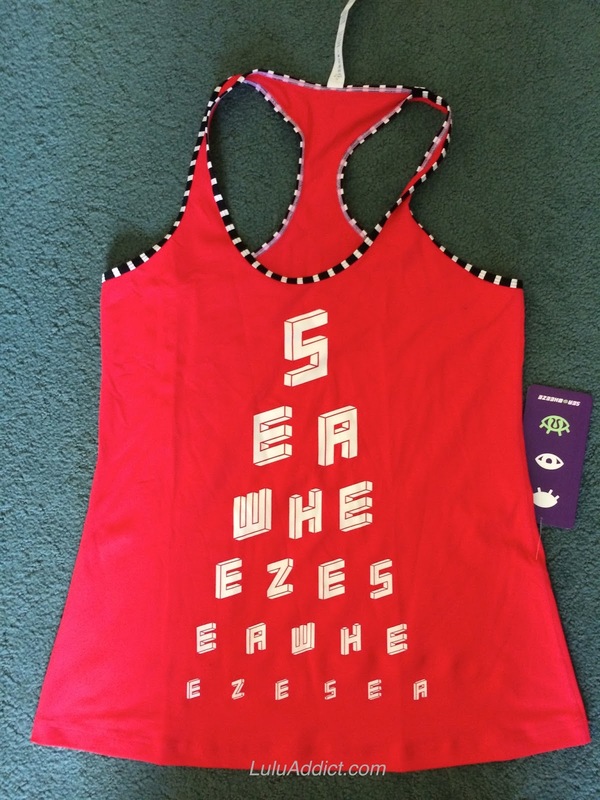 I think most people consider this year's Sea Wheeze merchandise to be the best yet. 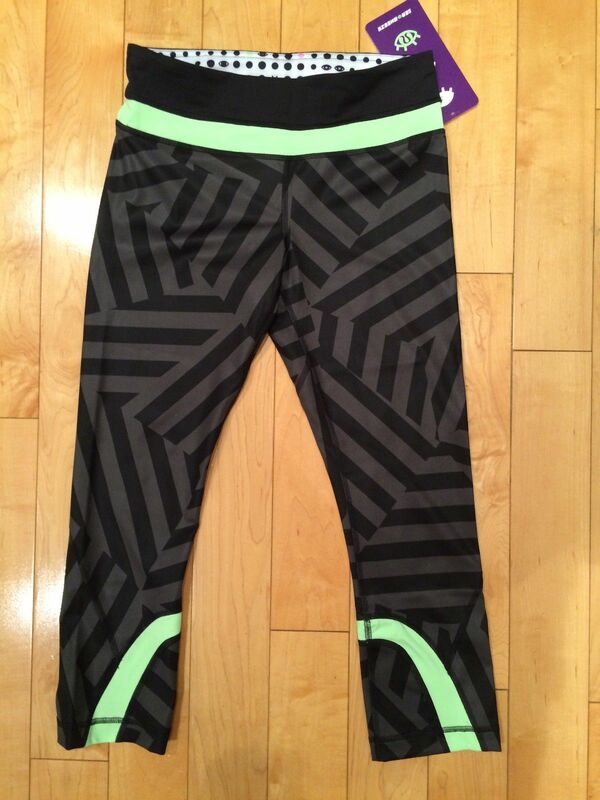 Lululemon did an excellent job with the colors, prints, and styles chosen. The Expo store sold out in one day and I heard it was $1M+ day. I also heard CEO Laurent Potdevin was there observing the frenzy but I did not spot him myself. 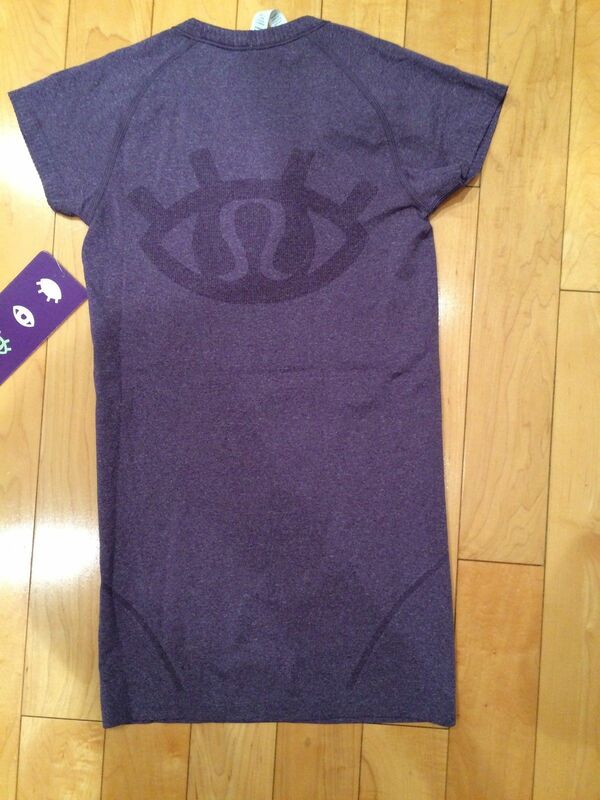 Lululemon definitely sandbagged us with the preview photos, the pre-expo buzz was very lukewarm when the photos came out. 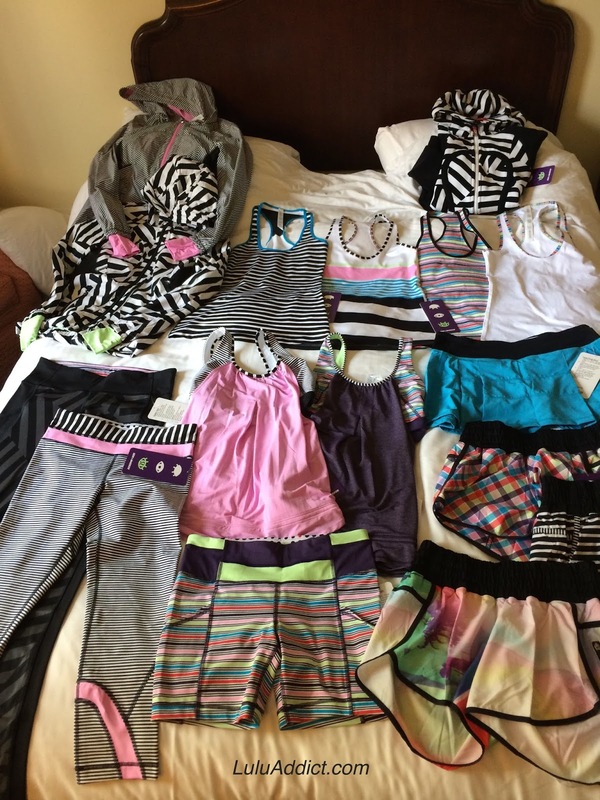 My sister and nieces's haul - Inspire Crops, Speed Tights, Dart and Dash Shorts, Downtime Jackets, Scuba hoodie, CRBs, Run Times Tanks, and a Pace Rival Skirt. My sister and niece's choices are interesting to me because they aren't in any lulu facebook groups so aren't influenced by hype. They go with what appeals to them and the functionality they need instead of what is the 'it' item to get. This year's Cool Racerbacks were made of light luxtreme. People definitely preferred them to last year's thicker, heavier Power Luxtreme but you might want to consider the next size up if you are looking to get these. 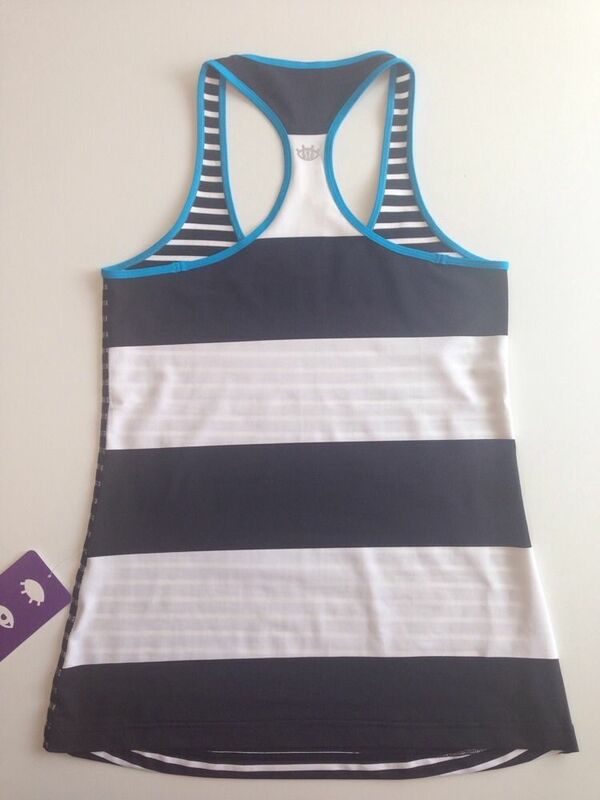 There were eight styles of Cool Racerbacks for sale: Black White Stripes, Blue Sunny/Lime, Multi Stripe, White/Multi Stripe edging, Red "race", Concord Grape Striped, White/ Black, Pink/Blue Stripe, and Vintage Pink/BW stripe. This year the jacket style was the very popular Downtime Jacket. A much, much better choice than last year's Track Attack and the first year's Nothing But Run jacket. It sold out very quickly. 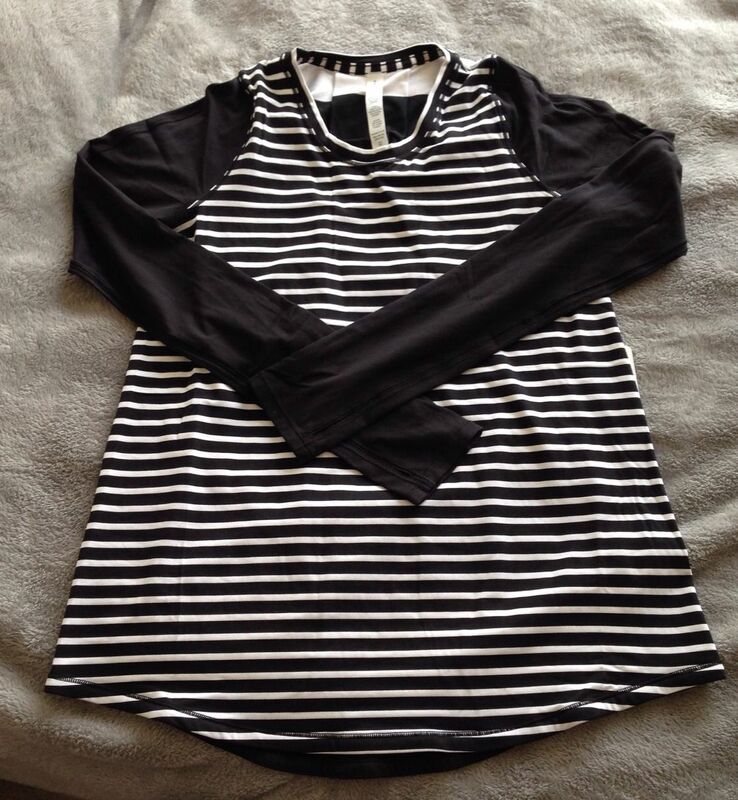 There were three styles - the Black and White striped one with Vintage Pink accents seems to be the most sought after, though they are all really nice. I went with my larger size for more arm room but I believe my sister got her regular jacket size. 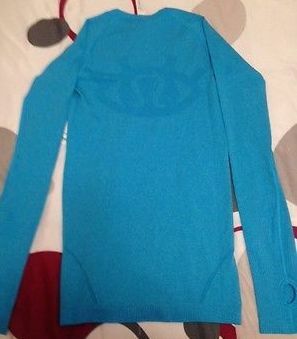 Last year I complained that the men got a rulu pullover but women didn't. 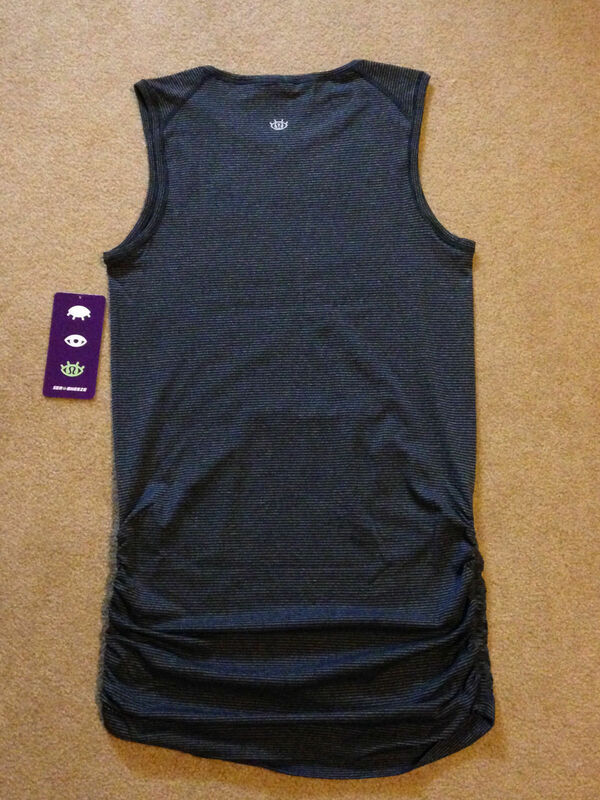 Lululemon listened and gave us the very popular Tuck N Flow LS in two styles. 2012 Sea Wheeze Keep On Running Duffel - I kick myself for putting this back. 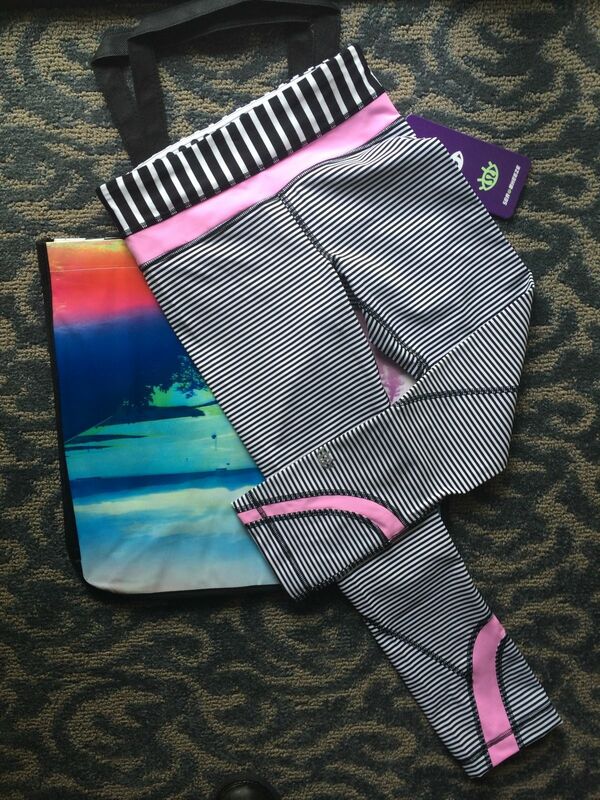 Last year's Sea Wheeze bag was a very ugly Yoga On the Run Duffel. They were such duds they got marked down within two hours of the Expo's opening. Even then, there were a lot leftover on Saturday at store closing. 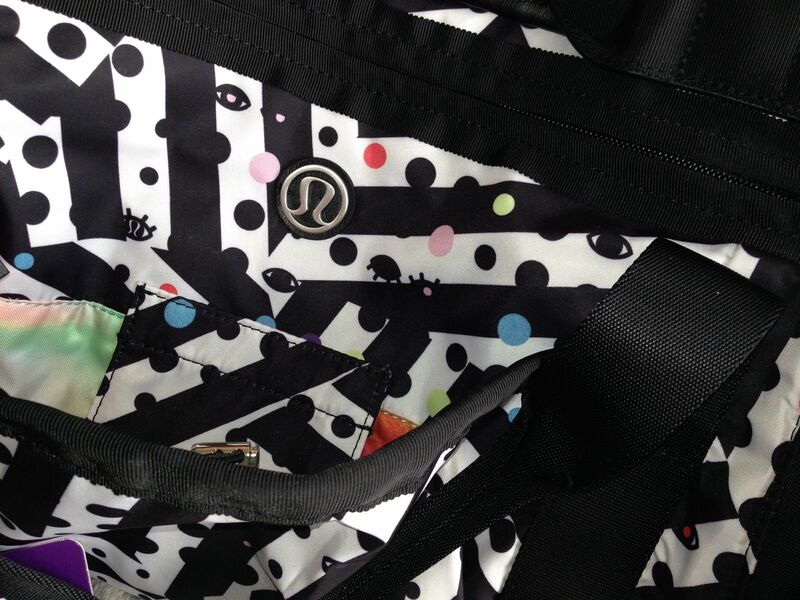 This year, lululemon went back to the Keep On Running Duffel in a very cute Sea Wheeze print. I believe these were sold out in the first hour or so of the expo. 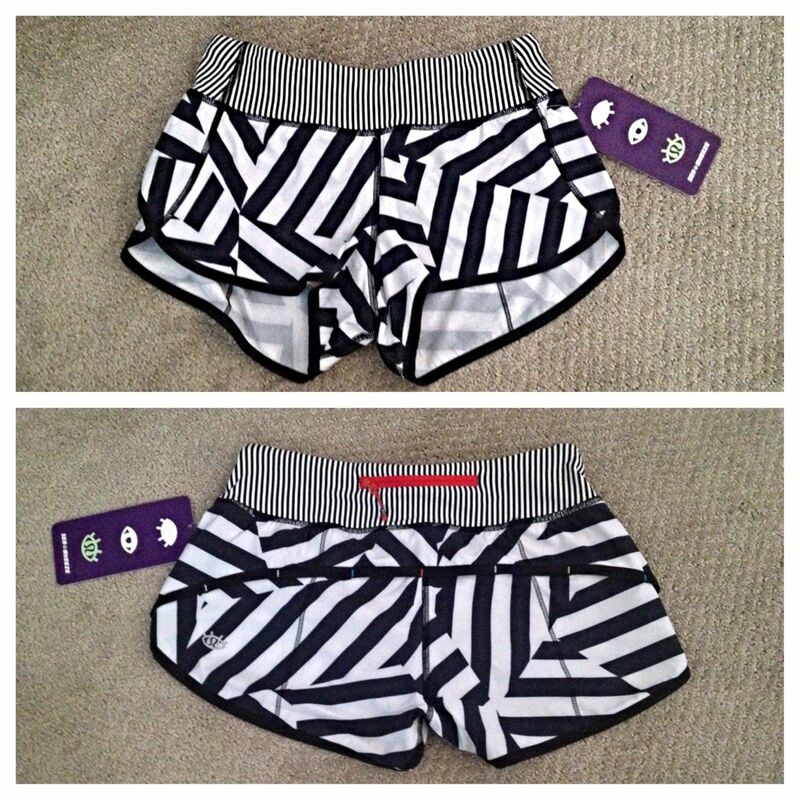 There were two colors of the Dart N Dash shorts offered - a multi striped and a version with gray chevroning up the side of the leg. I think there were seven Speed short patterns. Let me know if I left out some. The rainbow swirl are the most coveted, I think. Thanks to Ms. C. for this photo. There were five six Tracker II short styles. 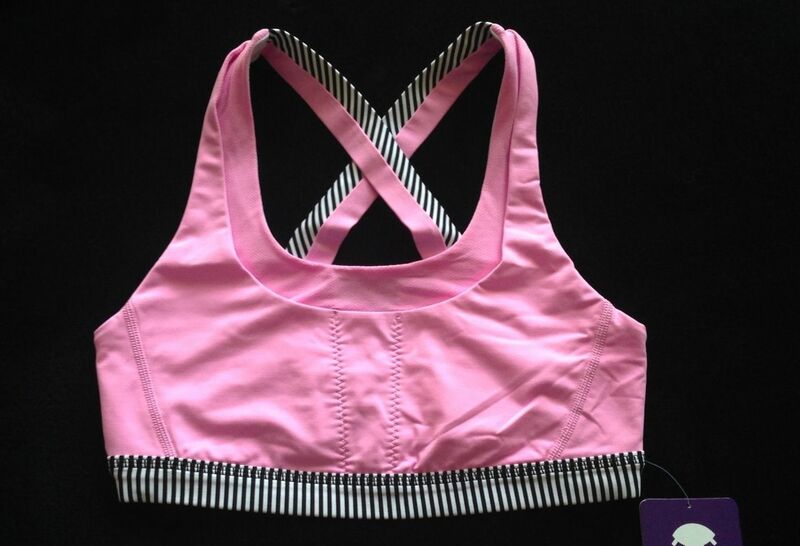 There were three styles of Bound Bras made. They all disappeared very fast, within the first thiry minutes to an hour. 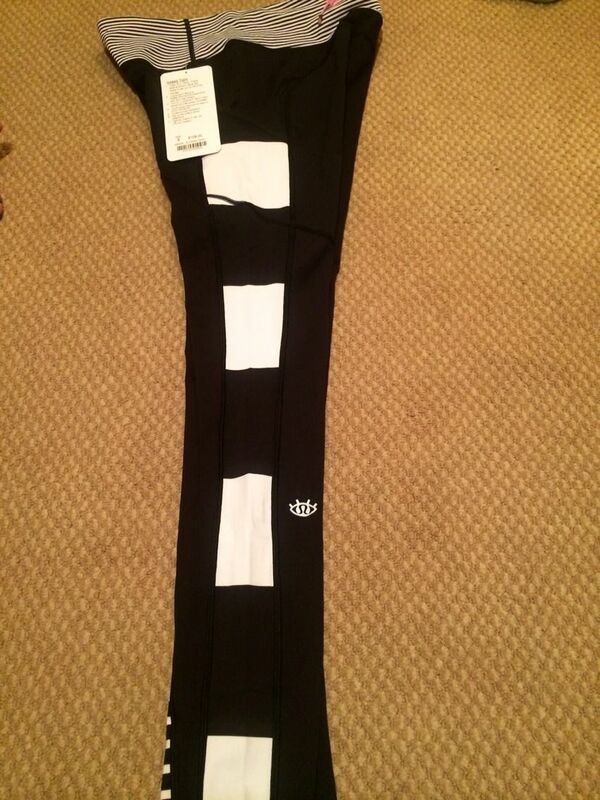 I don't think lululemon made very many. I got two of the three colors. I'd love for these to come back next year (make a LOT more, though!) and for them to be in the regular line, too. The Bound is my new favorite bra. 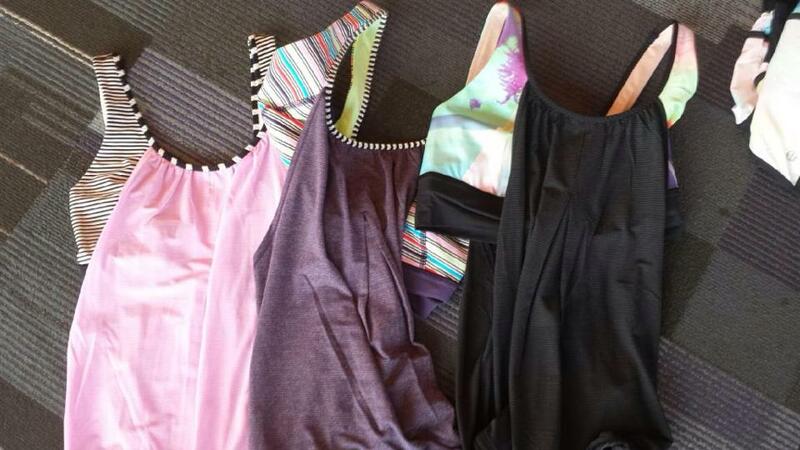 There were four Stuff Your Bra styles. These sold well but there were a ton of them and not too hard to get at all. 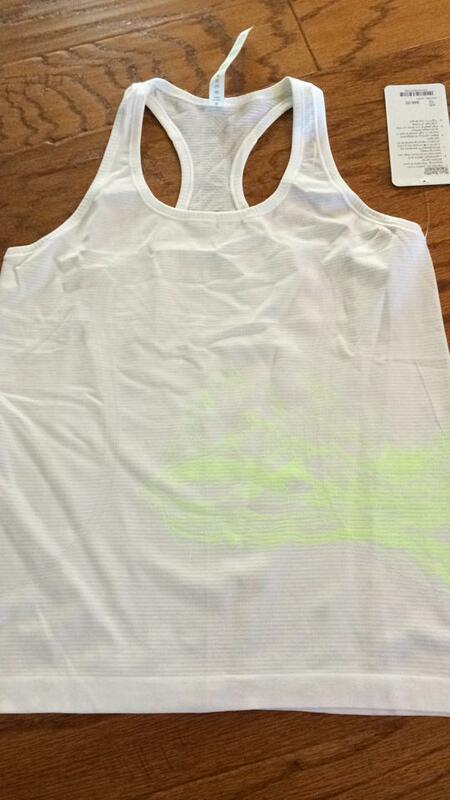 Lightened Up Singlet styles. 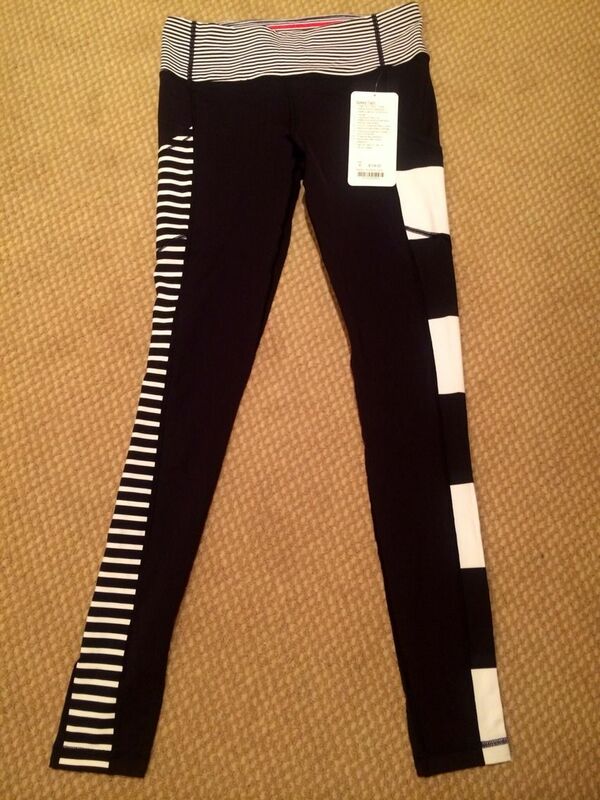 These sold well even though the fit is tricky. My sister went up one size and found it tight in the hips and big in the chest. She refused to go up another size to get it to fit right. 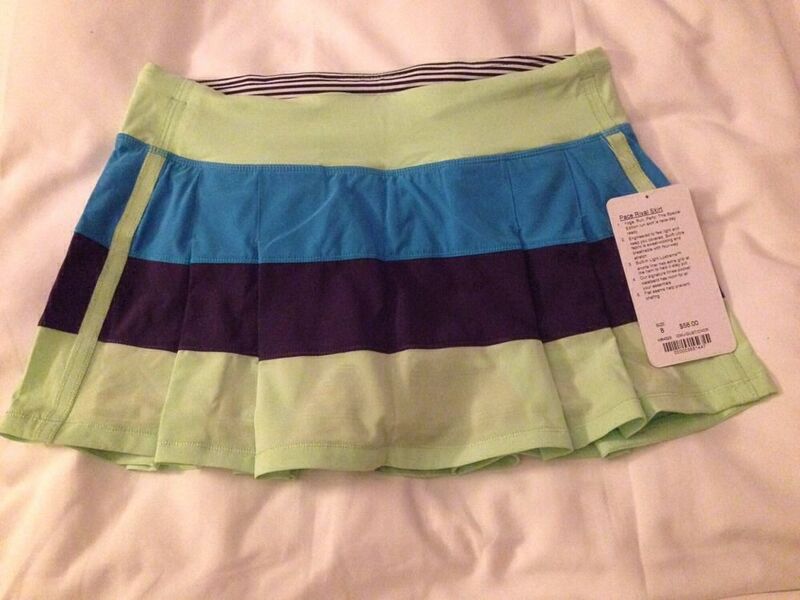 There were four Pace Rival Skirts for sale. There were five Inspire crop models for sale. 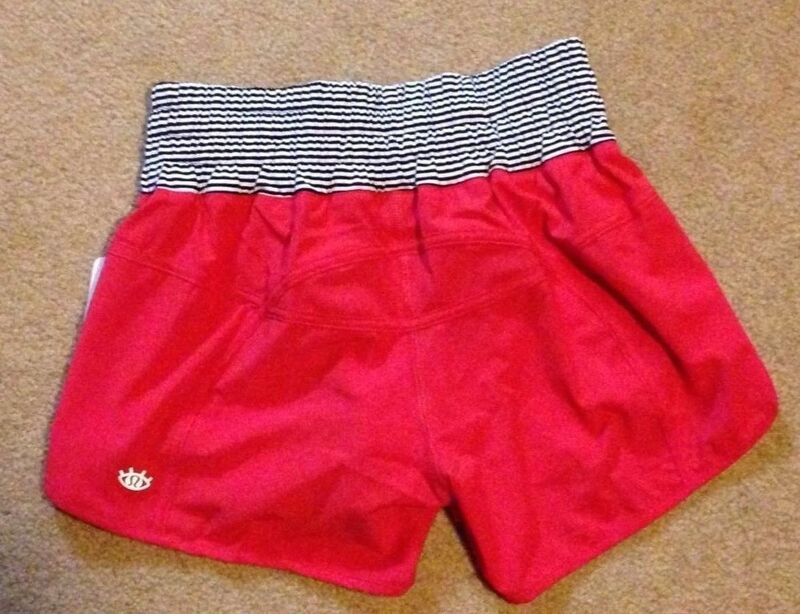 There were not nearly enough size twelve crops made. I passed on the crop rack on my first walk through and by my second pass the rack was empty. Very little size twelve merchandise was made, and not nearly enough size ten for that matter. Meanwhile, there is size two clothing left over. There were two Speed Tight styles. 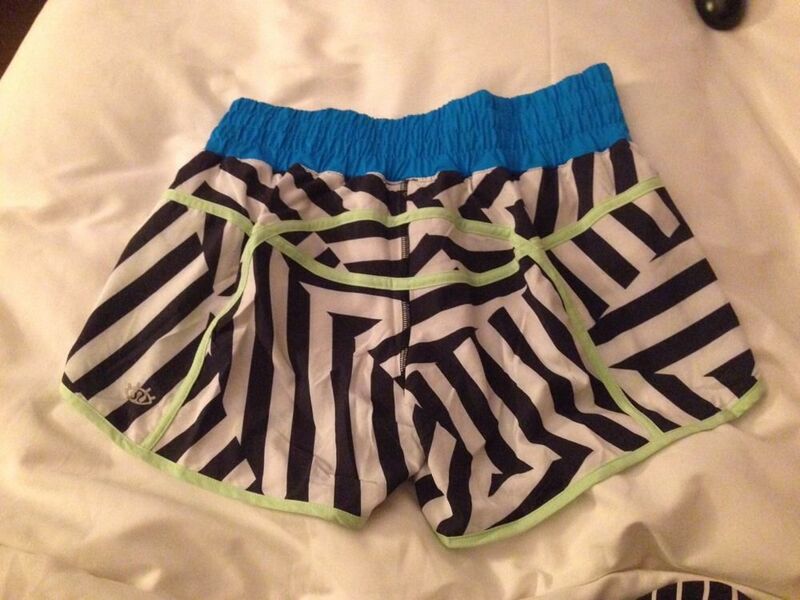 I believe these were a new style and they sold out very quickly. They definitely need to be brought back next year. This Race to Place color was the only offered. 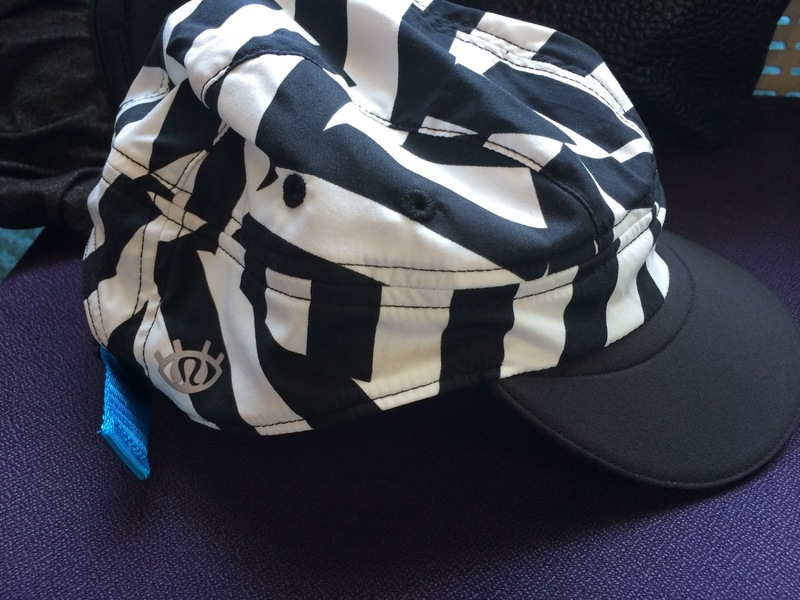 If it had come in the plaid I would have bought one but I didn't care for this print in the hat. Two Scuba styles were offered. 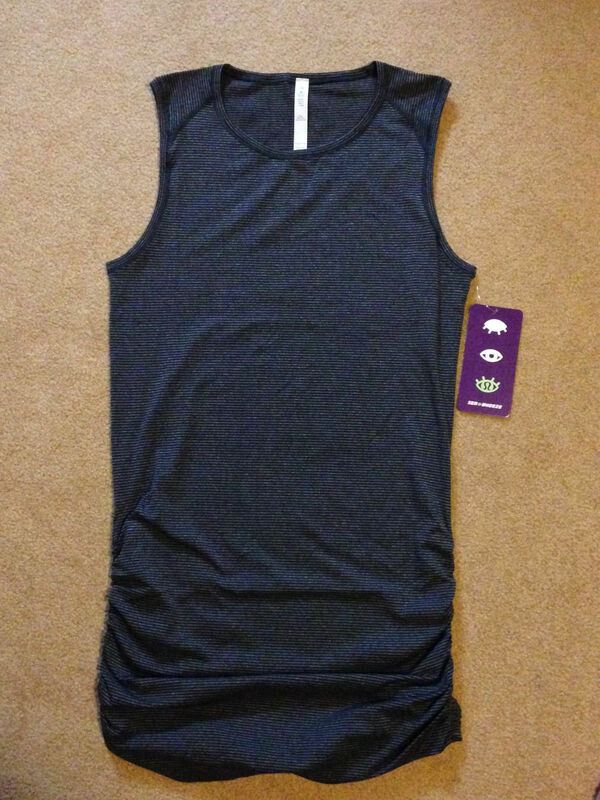 The top one, with the big eye logo on the back, was a very slow seller. I believe there were a number of those when I went back to the store around noon. 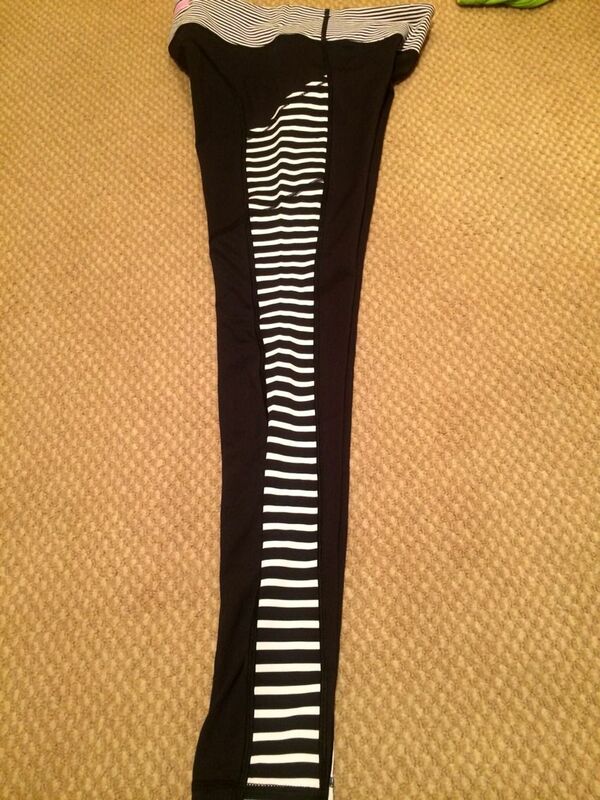 The Black and white crazy print was a hot seller. 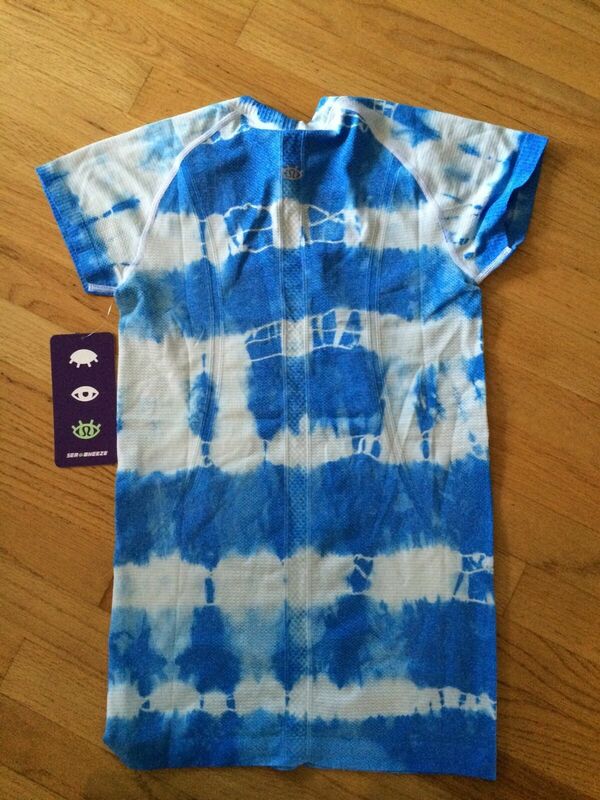 There were two Swiftlys that came with the eye logo woven into the back, a purple and blue. They were offered in a short sleeve and long sleeve and looked really cool out on the race course. I really liked the woven logo and hope they do that again next year. Thanks to Ms. F. for this photo. 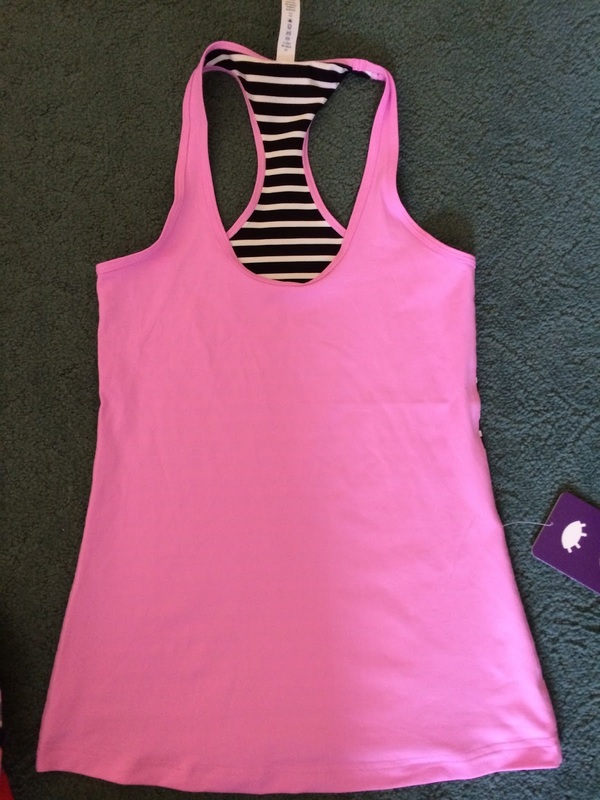 Three colors came with a screen print - white, blue and pink. I think these came in a tank and short sleeve only. I definitely like the screen print idea to distinguish these swiftlys from others. 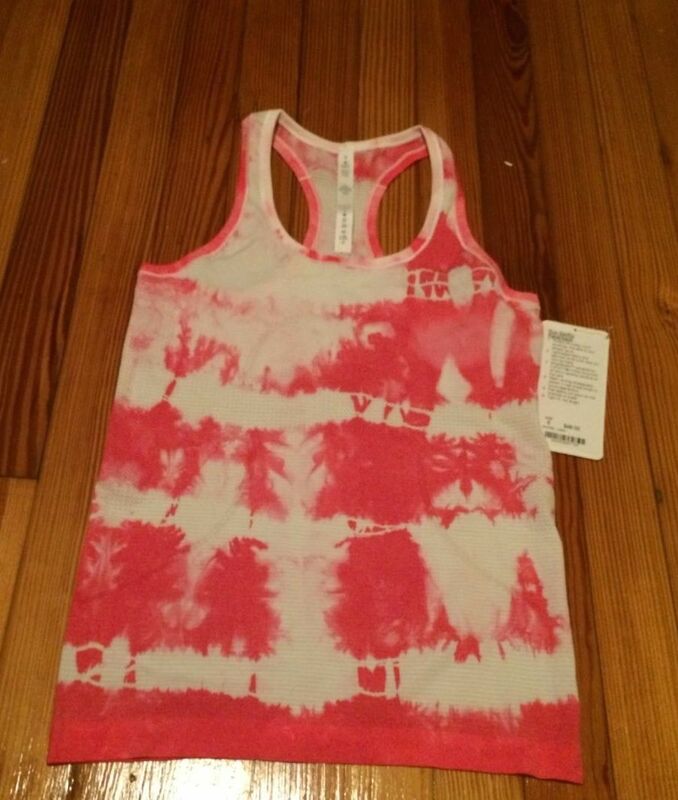 There were also two tie dye colors in all three Swiftly styles, tank, SS, and LS. I love tie dye but was spending enough on SW merch so passed on these. There were three different Run Times tanks offered. 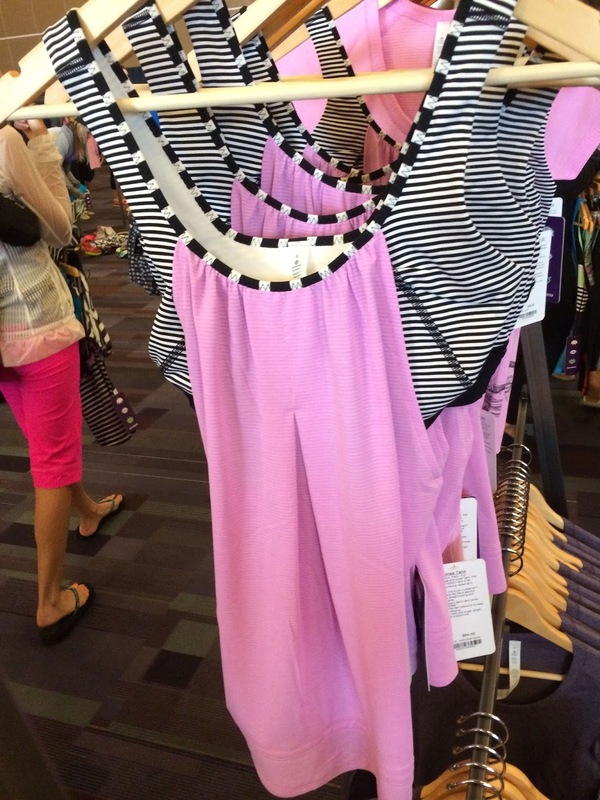 Update - Ms. C. reminds me there was also an In the Flow Dress offered. I am blanking on how many colors it came in but I think no more than two. 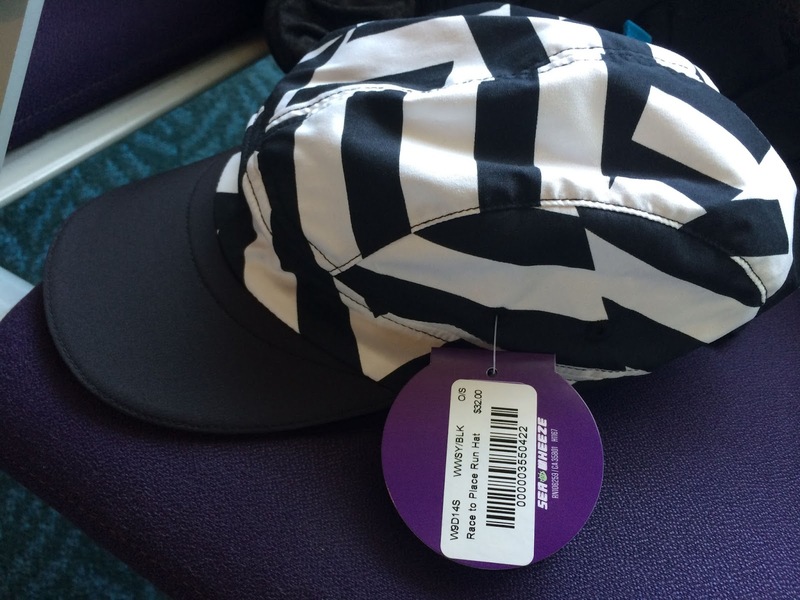 There were also Fly Away Tamer headbands in rainbow and various striped prints. There some socks, too. All in all it was a very nice merchandise selection and I think lululemon would do very well offering the same styles next year. My biggest complaint that the size twelve section needs to be increased by 30-50% more, if not doubled, since it was very small. 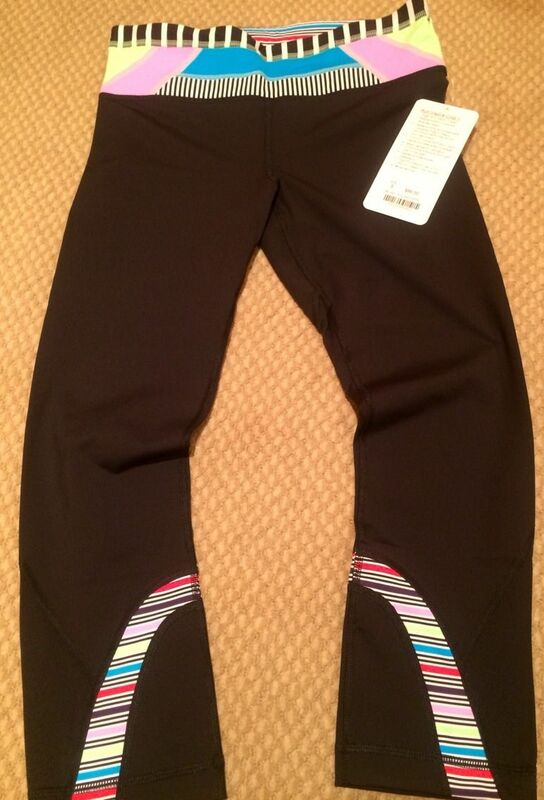 Size ten also should be increased, too, since those two sizes ran out very quickly. 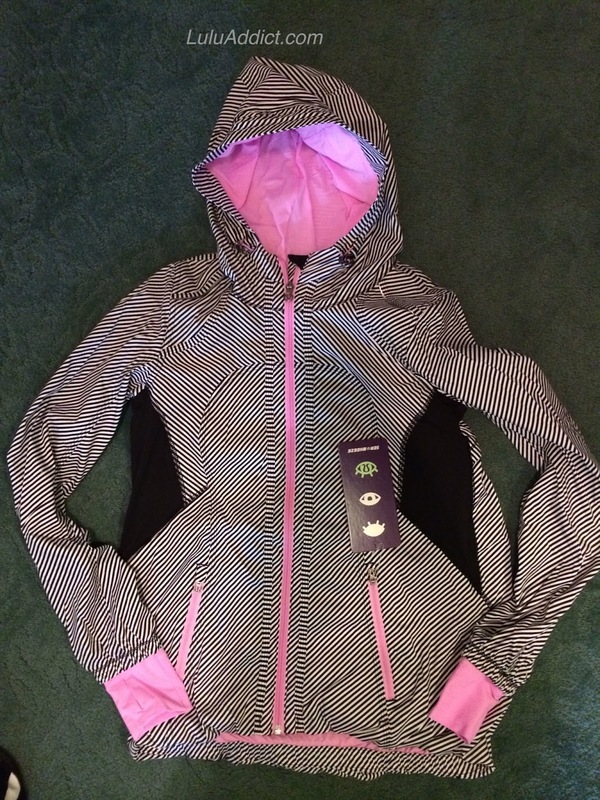 PS - I forgot to say that I was hoping to see a UPF LS top like the RunBeam LS or Run in the Sun LS that I picked up at the first Sea Wheeze. 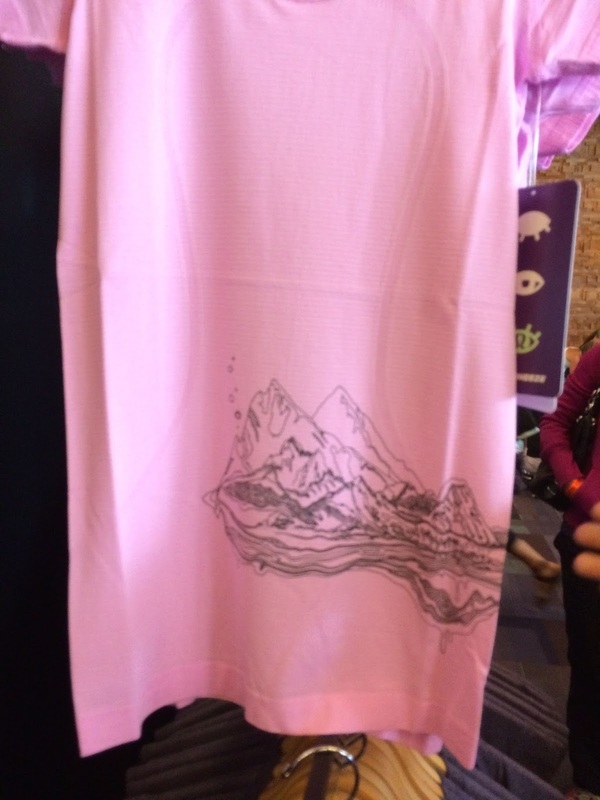 I would also love to see a print VitaSea SS or LS top added to the women's line. Man, these ll styles are sooooooo cute!!! I want them all! 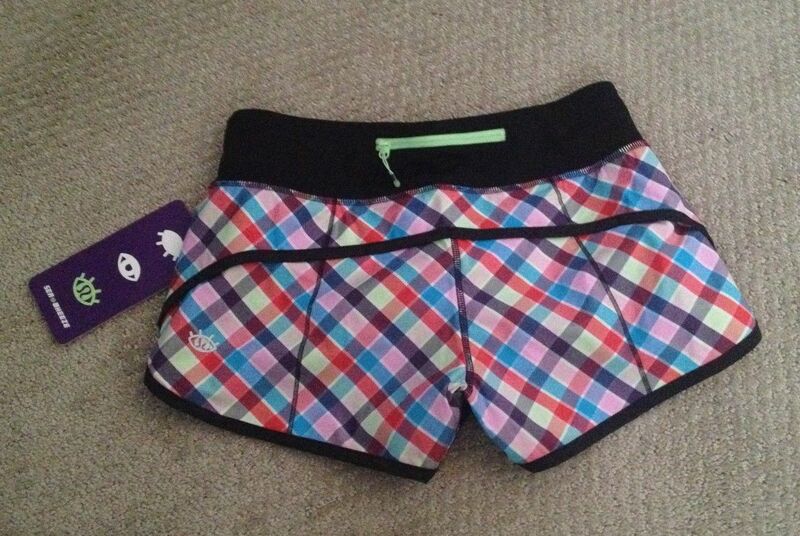 I'm new to lulu as of early this year, and I loooove your blog!! 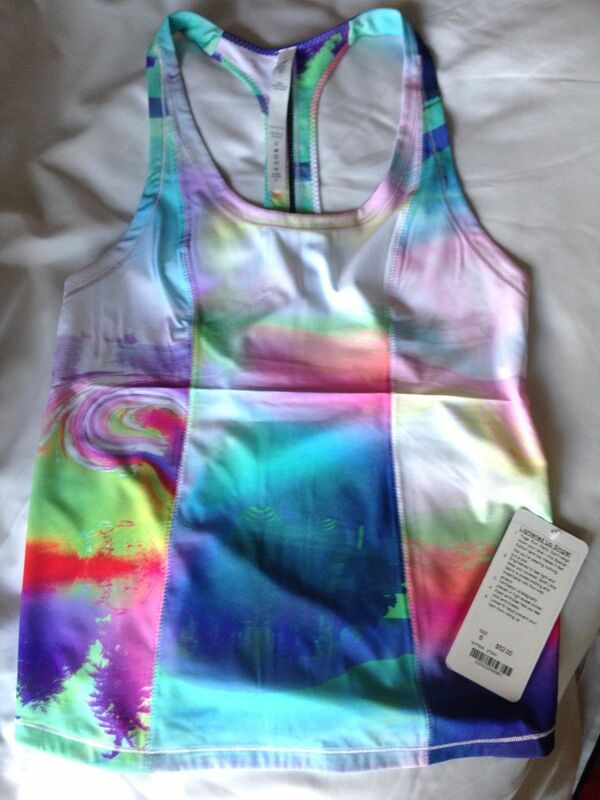 Do you think the stores will ever get say the rainbow swirl print in for the people that didn't get to attend seawheeze? Thank you for this entry! It's great to see all the offerings, for those of us who couldn't be there in person. 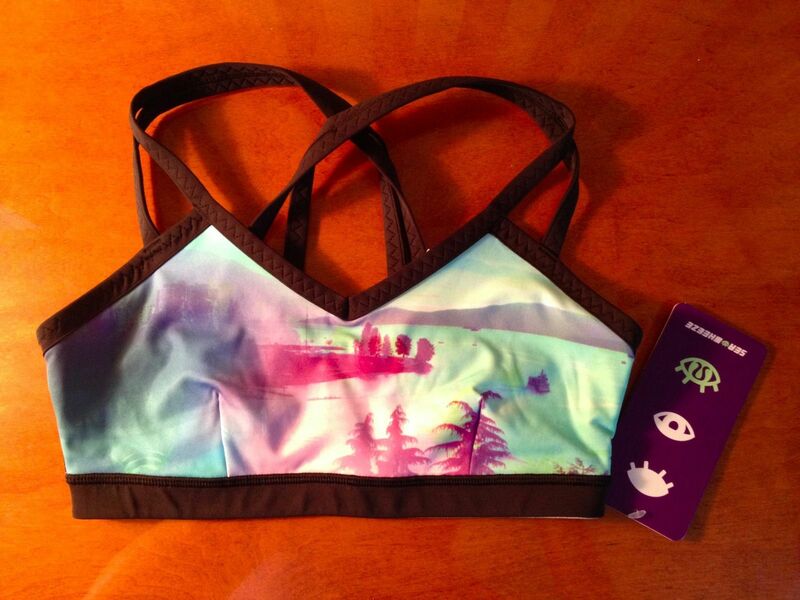 These Seawheeze items and styles are really rad-- so much nicer than the stuff on the website for general sale. 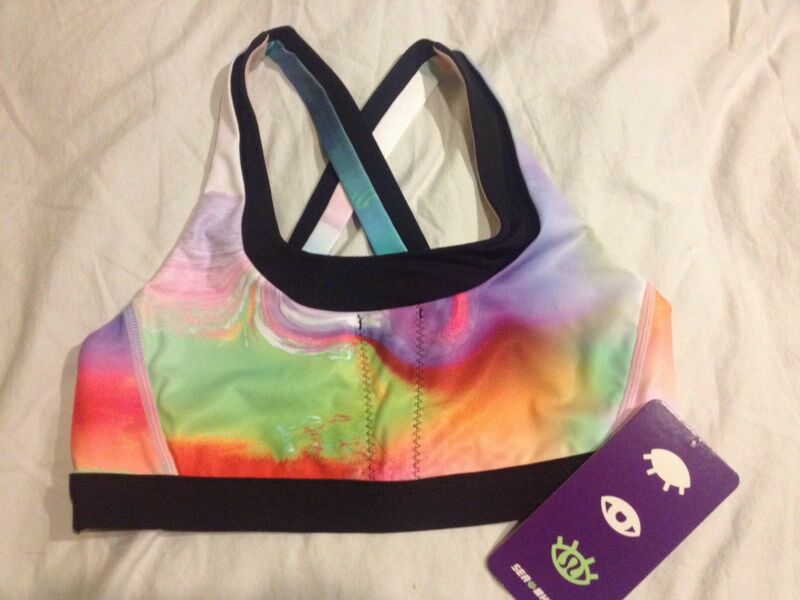 LOVE all the rainbow items. I'm curious about the pricing. 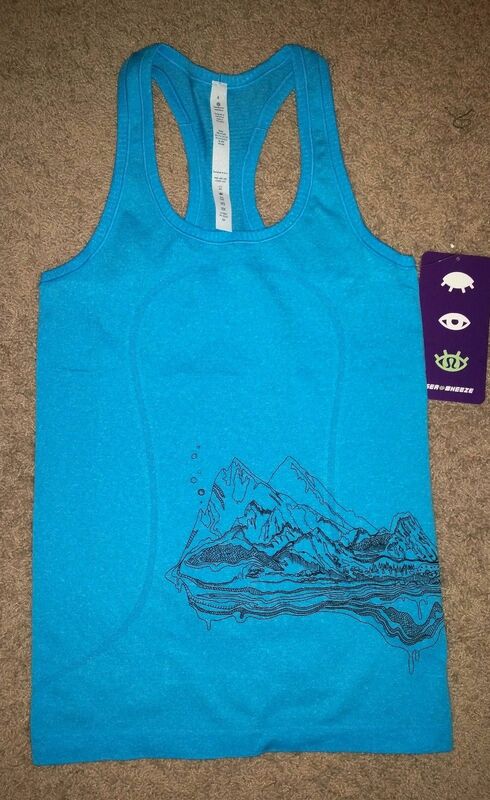 Is Seawheeze merchandise priced the same as, or more/less than, the general merch? Those Seewheeze styles are BEAUTIFUL!!!!! Will we ever see these in the US stores and if not WHY - nothing appealed to me this summer, boring dark depressing colors, blah styles. LLL if you read this blog - those Seewheeze styles and colors are what your devoted base misses. 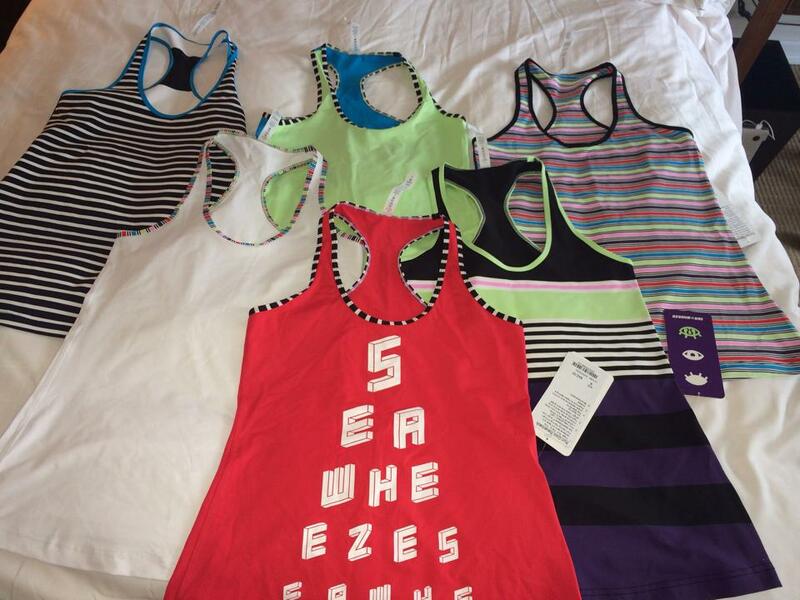 Thanks for posting all the photos from your Sea Wheeze weekend LuluAddict! I've never been a runner, but after reading up on the Sea Wheeze run and the training for it and all the people having fun with it, makes me want to give it a try! Love the merchandise too, especially that plaid jacket you bought, lucky you! I am salivating over so much of this stuff. I've had money budgeted to spend on lulu all summer, and I pretty much nothing has been thrilling me enough to even put it in the cart. 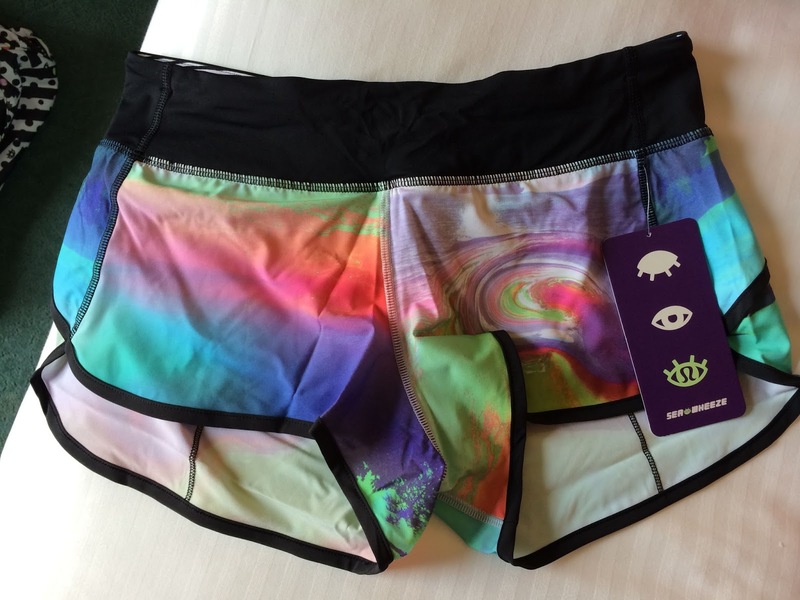 Not that they shouldn't have awesome SE stuff for Seawheeze, but why can't they put some effort into putting out equally awesome stuff on a weekly basis? Cool post! On another note, the Chilly Chill vest is selling like crazy in Calgary. I only found one Bordeaux left in size 6. I actually like the Inkwell and Bordeaux best in person. Fits a bit larger than normal I would say. I have to say that I am NOT happy with the new shipping process. I live in Cali and used to get my orders in 2 days from Canada. Now they come from Ohio and they take an entire week to get here, WTF??? 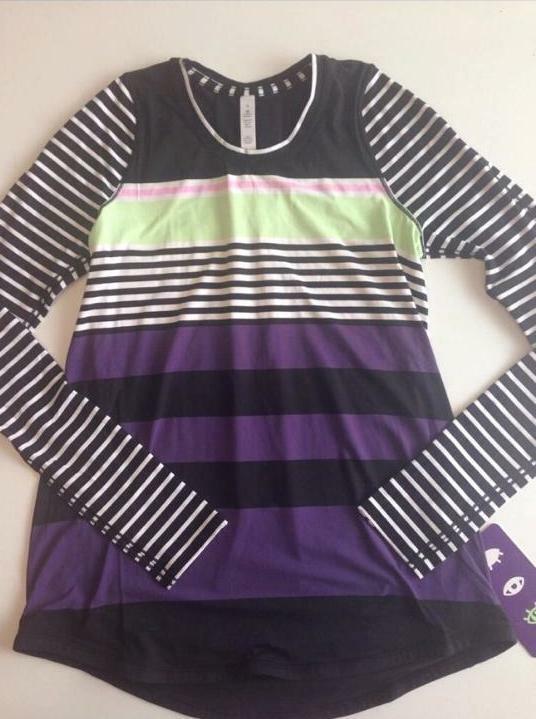 It's unfortunate lulu didn't make this color scheme/prints available to everyone this summer instead of the boring color palette they had. @ anon 1:56 pm - are you kidding? I thought we got ours from the Washington state warehouse. That blows. My stuff used to take two days, too. 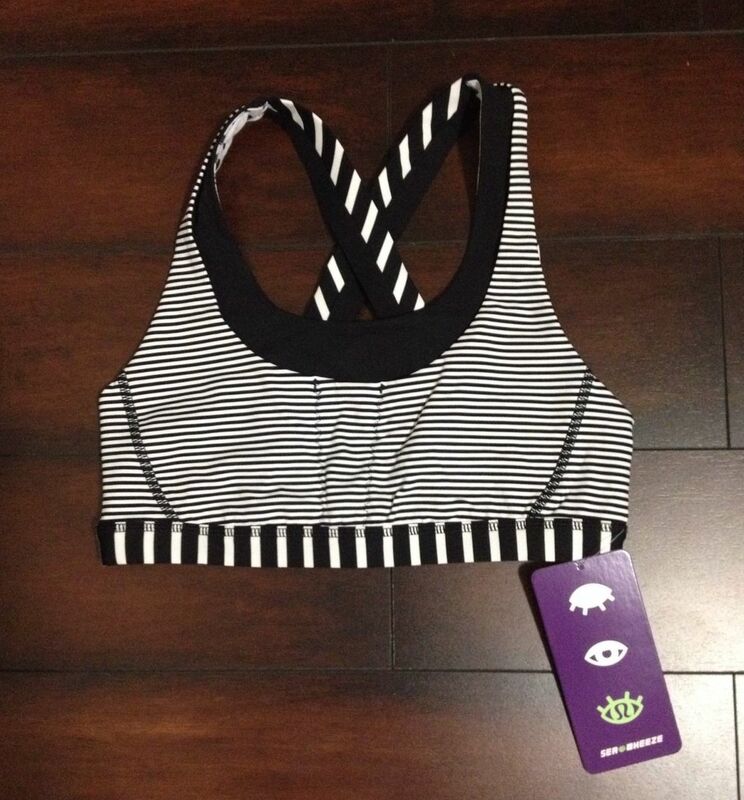 Some of these items should be offered to Australia but with the regular lululemon logo instead of the SW eye logo. If you can find an Australian angel you should be able to get your hands on them. I also live in Caliifornia and sometimes my shipment gets split in two and they do come from Ohio instead of Washington. By the time I get my stuff if the size is not correct, the items will be sold out if I want to exchange. I have orderd towel/mats twice and they never made it. I'm assuming they were from the Ohio hub. Not happy with it! It probably depends on if the item is in stock from the warehouse closest to "ship to" address. I am also in CA, and so far all my items still come from Sumner, Washington state. But I've heard that some may get their order split from both US warehouses. I guess it's better than having the order cancelled due to out of stock from one warehouse. Wow! Thanks for the great product recap. The red is awesome. 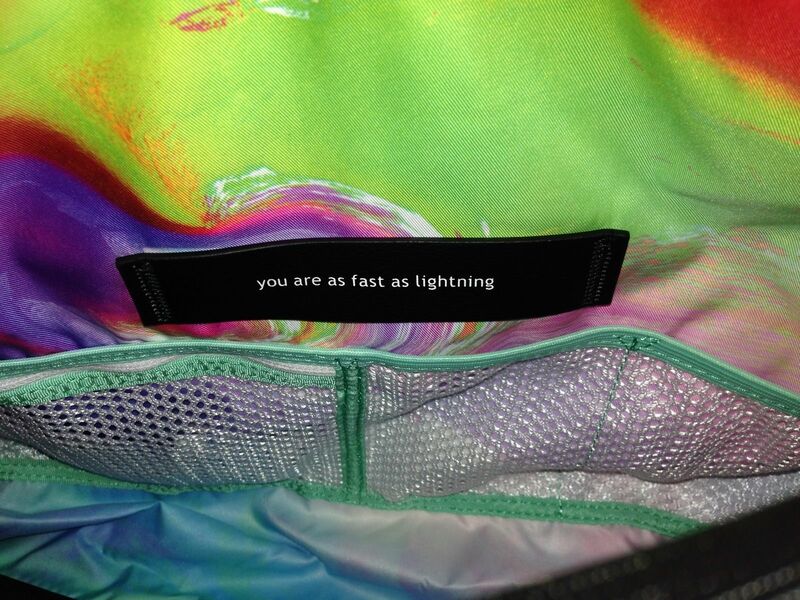 Love the rainbow, the tie-dye, the speeds, the inspires. retail? Or is it all exclusive for SW? Love your recaps, LLA. I'm planning to go next year--can't wait! And yes, the new warehouse situation is irritating. I am in the PNW and used to receive my orders the next day. I placed an order on Tuesday assuming it would ship from WA and arrive on Wednesday, but it was shipped from OH, so I won't get it until tomorrow or Tuesday. In the grand scheme of things, it isn't a big deal, but it does irk me a bit. It is great for the east coasters and midwesterners though! Thank you for organizing all the clothing like this. I was in the second wave that was let in at 7:08 and my head was just spinning trying to find all the things I wanted. Thankfully I wear the same size in tops and bottoms. I got everything that I wanted but it was quite the experience. I'm glad I went to line up earlier as not sure what the selection would have been like by 9:00 or even 10:00. We lined up at 5:45 so it didn't seem like that long of a wait. It was so much fun, my daughter in law and I want to go again. I find the run the easy part. The most stressful is registration and running around the sea wheeze store. Don't know if you noticed all the people that didn't have finishing times, think I figured it was just under 2000. That's quite a few that register but don't go, some of course have things that come up or injuries but I thought that was quite a lot of people. 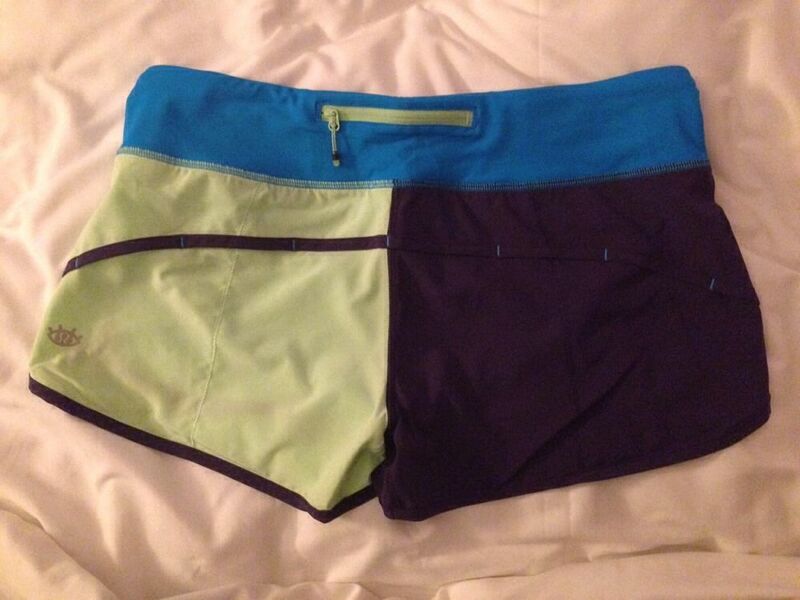 Maybe if people received their shorts with race pkg pickup there wouldn't be as many people that register just for the shorts. Yes you're right, they came from Washington. But now the last 2 orders have shipped from Ohio and take 7 days. I order Wednesday and they don't deliver until the following Wednesday. Lame! 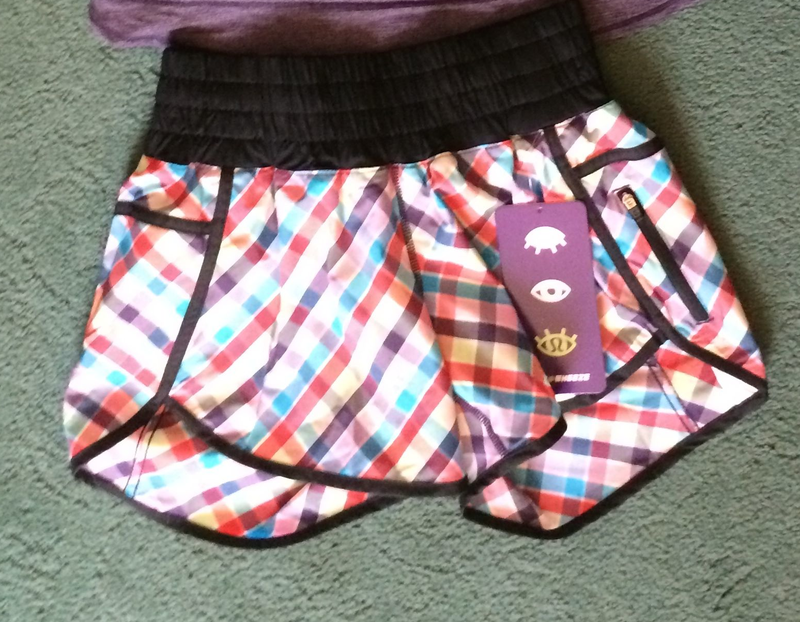 Oh the styles and COLORS of the SeaWheeze merchandise are great this year, I agree, the best so far. Last years SeaWheeze Easter Egg palette was particiulary blah. 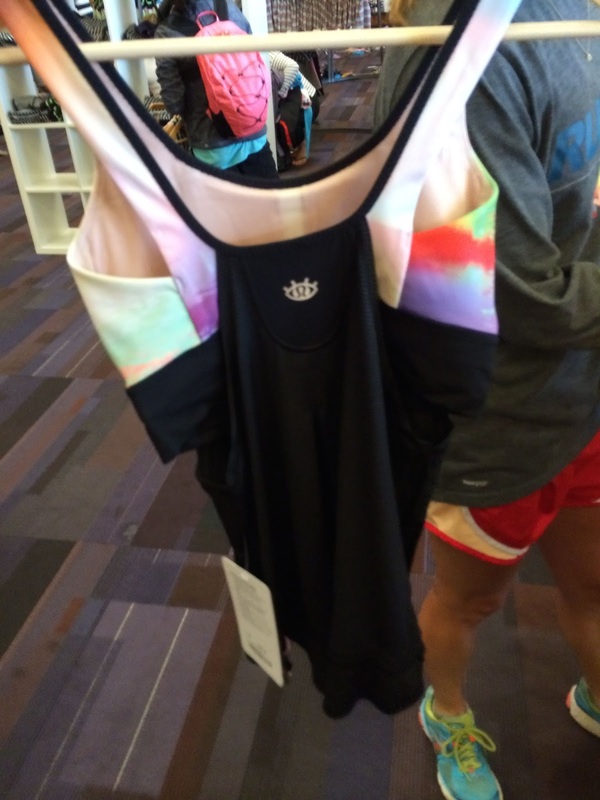 Why oh why has Lululemon saved all the color for SeaWheeze. I have to agree with a lot of the ladies that posted here today, I am so sick of all the black and white in their regular product lines. I'm in Northern CA. I get my stuff in 2 days. The bag that came today shows there's a distribution center in Sumner, WA. Great post, LLA, well worth the wait (I can see your engineer's mind at work ;) ). 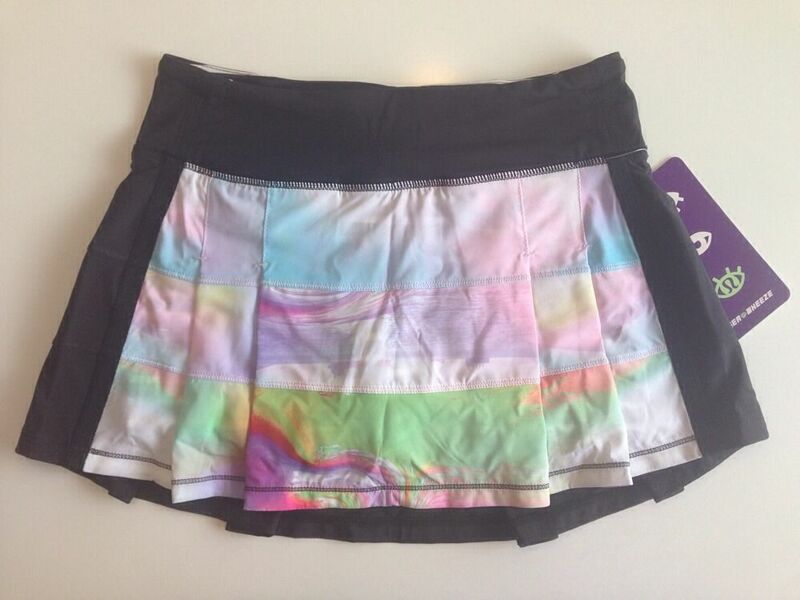 Loving the mini multi stripe, tie dye and rainbow swirl items. 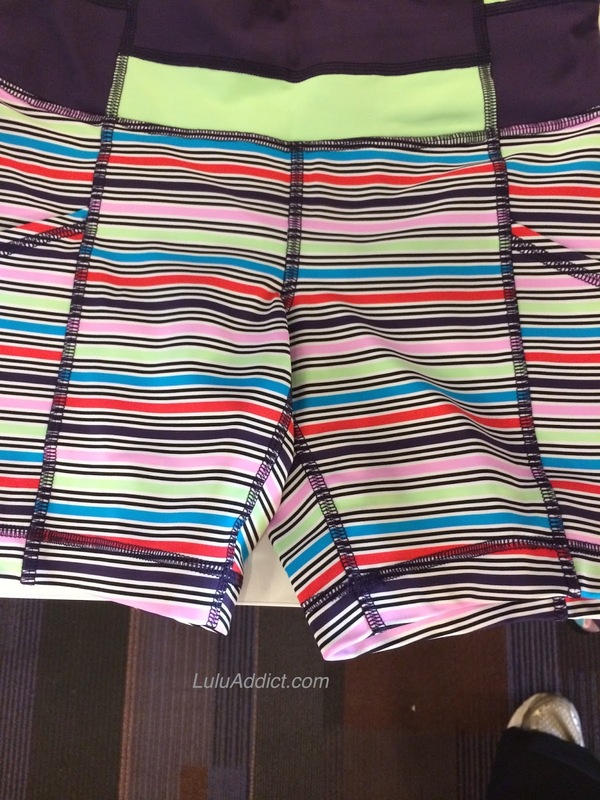 Much like every non-racer here, I'm envious that lulu doesn't offer such glorious patterns and colors with its regular merchandise, especially the CRBs and shorts. Seems silly to me because they would all go in a flash and not linger in WMTM. LLA , thanks for showing us all of your goodies! I wasn't there as early as you but did manage to overspend and get 15 items....I got 2 tights, 2 inspires, 2 shorts, 2 jackets,2 tanks, and headbands. I couldn't believe all the hoarding and piles of clothing some people had! There was a group of women who had over 100 pcs and several times I noticed employees asking them if they had stuff they didn't want. The employees were super great and very helpful. Love the Ohio distribution center!! For years I have waited at least a week for my order to arrive in Indiana...now my things arrive within two days. So much better for us in the Midwest to east coast. Thanks for sharing the photos and your recap. That alone is a lot of work! Nice haul for you and family and glad you got what you wanted. Some nice selections for sure. 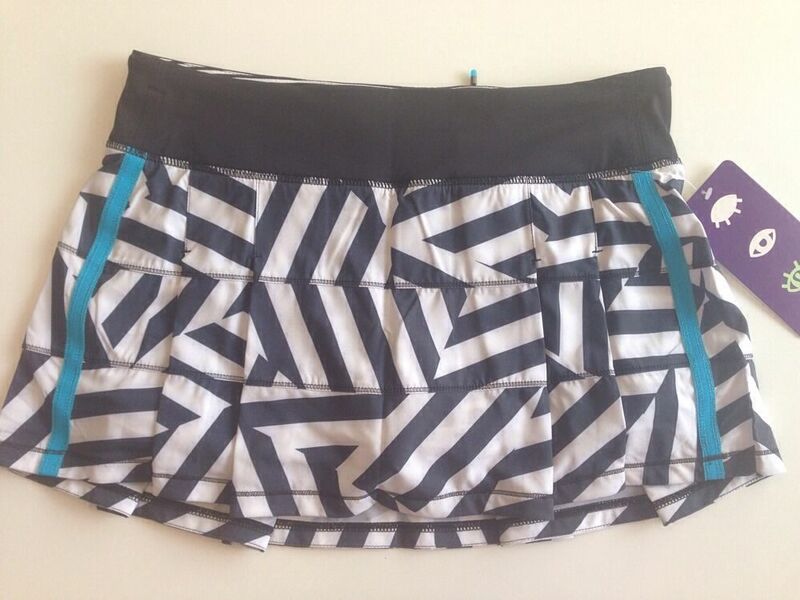 I like those black and white speed shorts and the black & white jacket with the pink lining. How long did you have to wait in line to pay? It just didn't work out schedule-wise for me to attend this year but maybe I will try to go again next year. I know registration is NOW a competition in itself and thanks for your previous posts on that, and the nightmare that it was to try and register this year. And it's true about the shopping competition and grabbing what you want and then trying to decide. Whoever asked about it showing up in regular stores: no, exclusive to SW. Might be a release for Australia & NZ without the SW branding. @ 8:19 PM, I did that in year one for the striped CRB! They were gone so quickly and it was the one item I wanted the most. I finally got one when the change room stock slowly made it back to the retail floor. Two came out and the educator did not even get a chance to hang them up as myself and another girl were waiting for them. Was very pleased with the selection this year. So much better than last year (even though I went crazy buying stuff then as well). 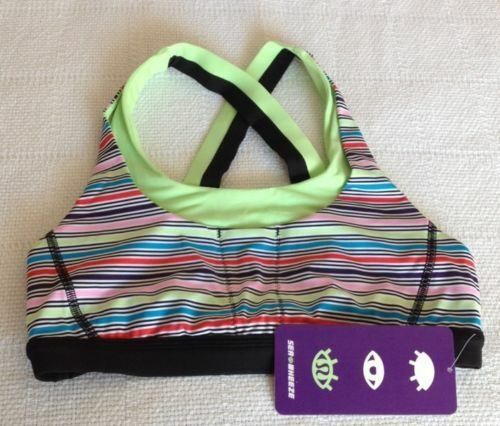 Picked up four CRBs, speed tights, pace rival (4-way), socks, the bag, tuck and flow, two stuff your bras, and the pink SS swiftly. 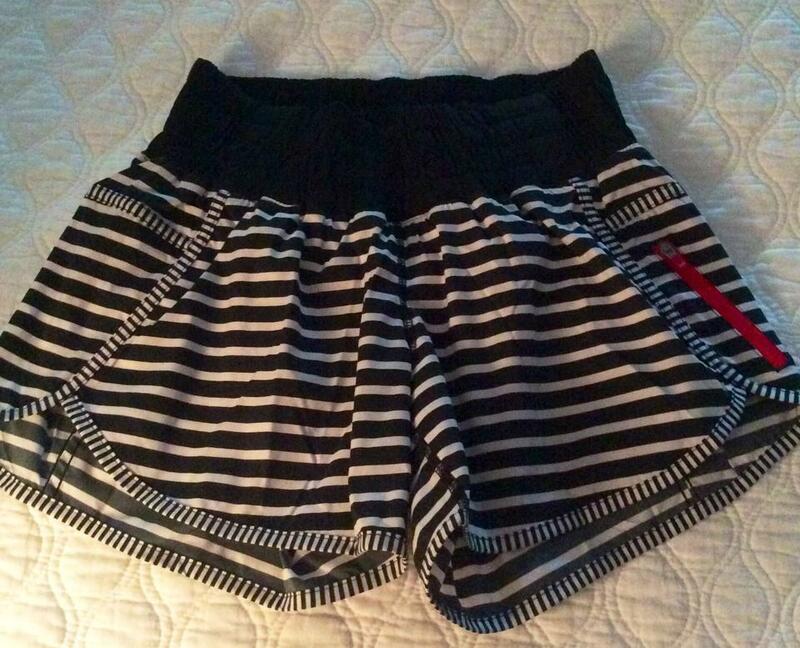 Hubs got shorts and two shirts. I hope they release this color palatte at a later date - it's one of the best I've seen. I got in line for the SW Store at 6:45 (oops) took 1.25 hrs to get in (not bad considering we were on the third side of the VCC) and I got everything I wanted except the wacky ceveron Inspires :( it was such a zoo in the store. I went to the 2012 SW and I don't remember being so overwhelmed in the store. So much to look at and so many people, crazy. Loved every minute - now if I could just get those inspires at a decent price, lol. Thanks so much for the expo recap - it's amazing hearing the experience that others went through. 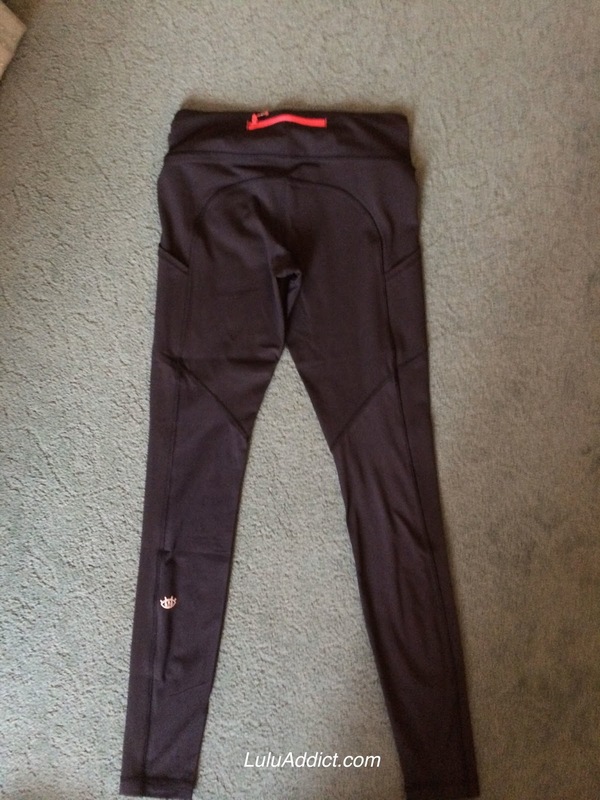 I spent nearly an hour searching for those speed tights, found them in an 8 early on but waited nearly an hour for them in a 10. Someone restocked he size 10 rack just before 9 and I was lucky enough to grab them before they disappeared. 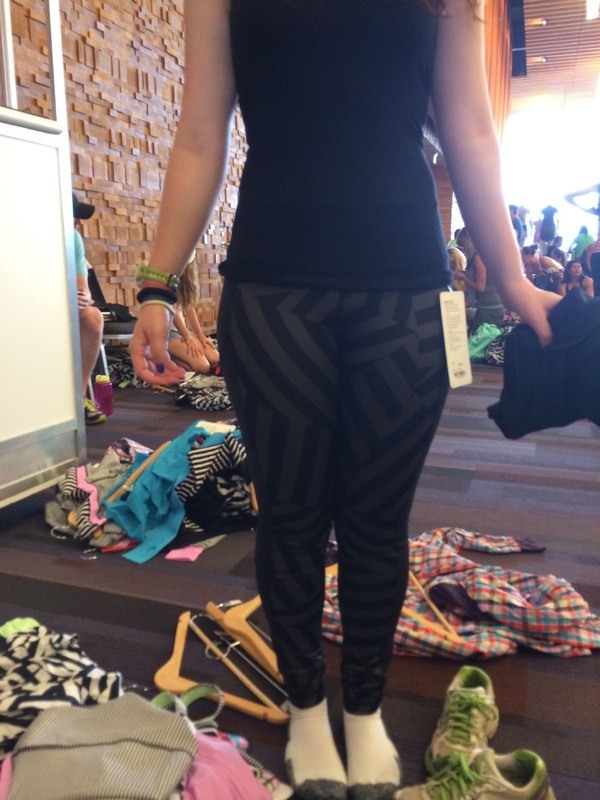 Although everyone talks about the colour - there was a lot of black and white with the seawheeze palette. 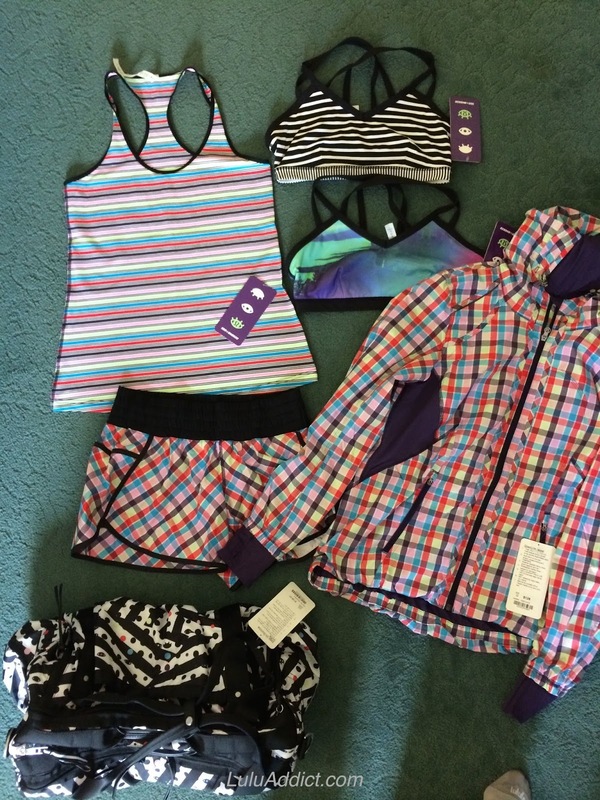 For example I got the scuba and downtime jacket both with the chevron pattern (mainly because I couldn't decide which one I wanted and bother were fantastic). 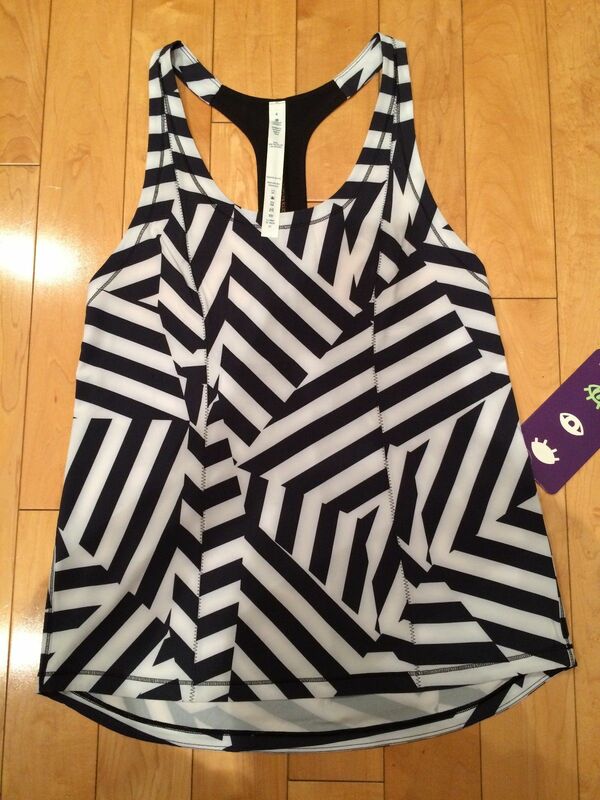 @Erin - I actually just picked up the wacky chevron inspires off a bidding site for not too bad a price. @ anon 11:41 -re: pricing. 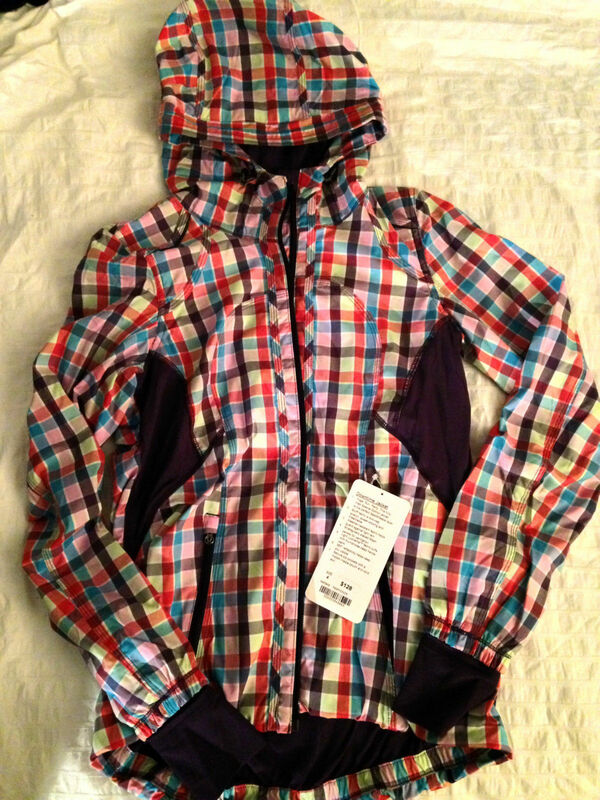 The prices are the same, i.e., CRBs are $42, etc.. However,the duffel and Downtime Jackets were $128. 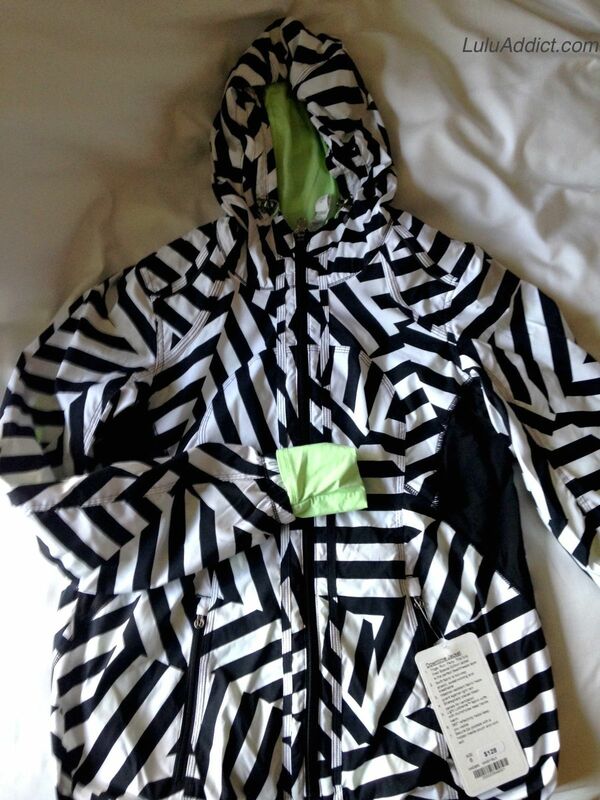 The DT jacket was white-stickered over and the original price on the tag was $148 and I know the Keep on Running Duffel was also $148 at the 2012 Sea Wheeze. 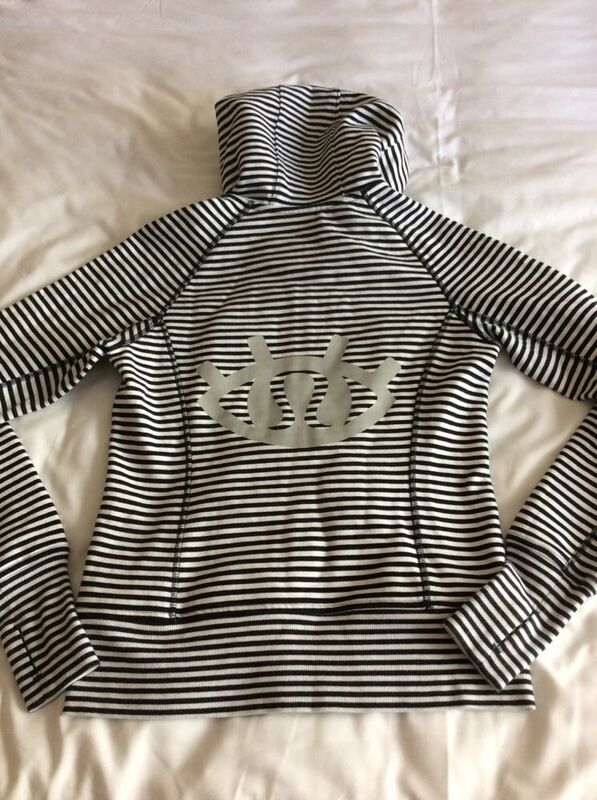 I love so much of the SeaWheeze merchandise: the Downtime black & white stripe jacket, the stripe Inspires, the pink with stripes CRB, the pace tights...I wish they would have brought these styles out for regular store purchase. This is the type of designs I want to see Lulu doing. I was in the secon wave in (lined up at 6am) and the first thing I asked for was bags...ALL gone by about 7:10! Ah well, I still got a bunch of items I really like (especially the LS swiftly!) but would line up even earlier next year. Hey LLA - what about the special Marathon /Half scubas forSunset Festival? How/where does LLL sell those two items? 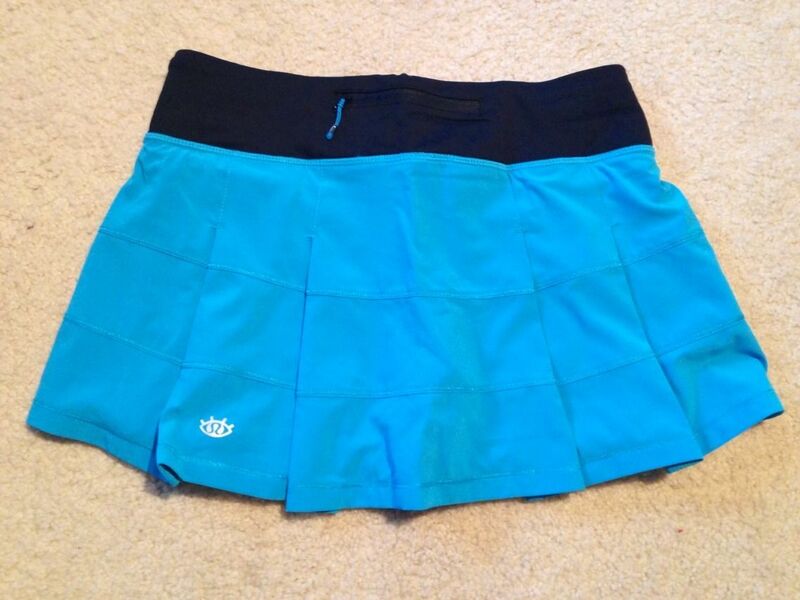 Thanks for sharing your pictures of the items. One day I'd love to participate in the SW run. I've started running recently so hopefully I can try for it. Oh my I can't believe how nice all this stuff is. Now I am really sad that I didn't go. 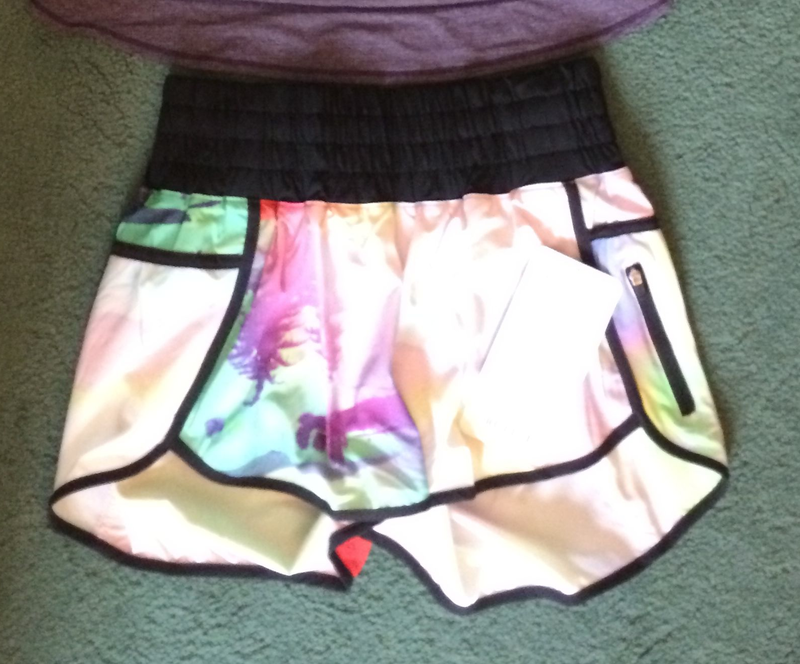 I love the bras and dash and dart shorts. All of it is so cool and original. 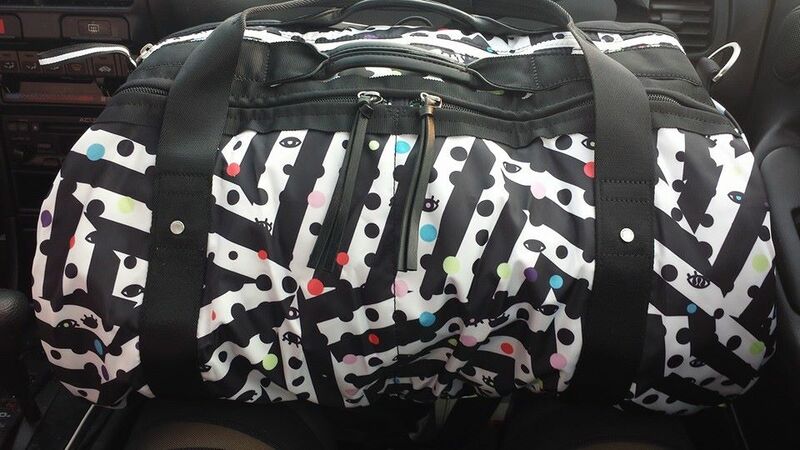 Just got my gorg Keep On Running Duffel. So glad I splurged for it on a bidding site - worth every penny! 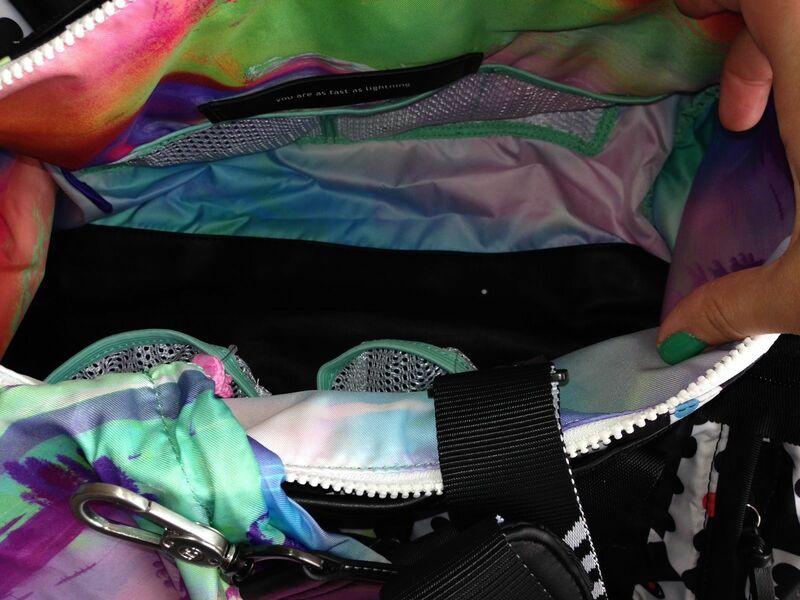 It has the bright rainbow swirl pattern all over the interior, including on the fabric lining the interior back of the bag, so you see the gorgeous colors when I've got it opened up to get into the interior while it's on my shoulder or arm. My sister said most of the bags she saw just had the lighter pale blues and greens, maybe a wee bit of the rainbow patterned fabric on the interior front of the bag, so you didn't even see it when the bags were opened. 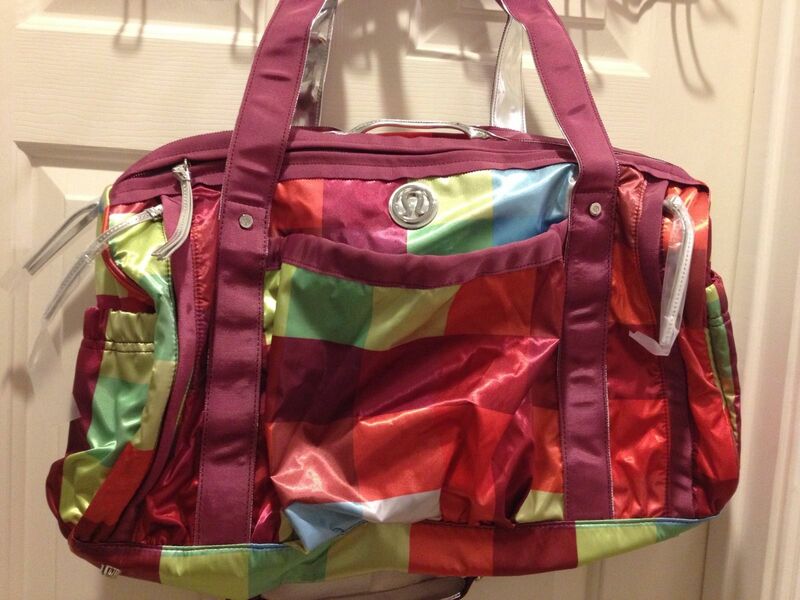 Not mine: beautiful bright rainbow swirl all over the interior, pockets and included drawstring bag. 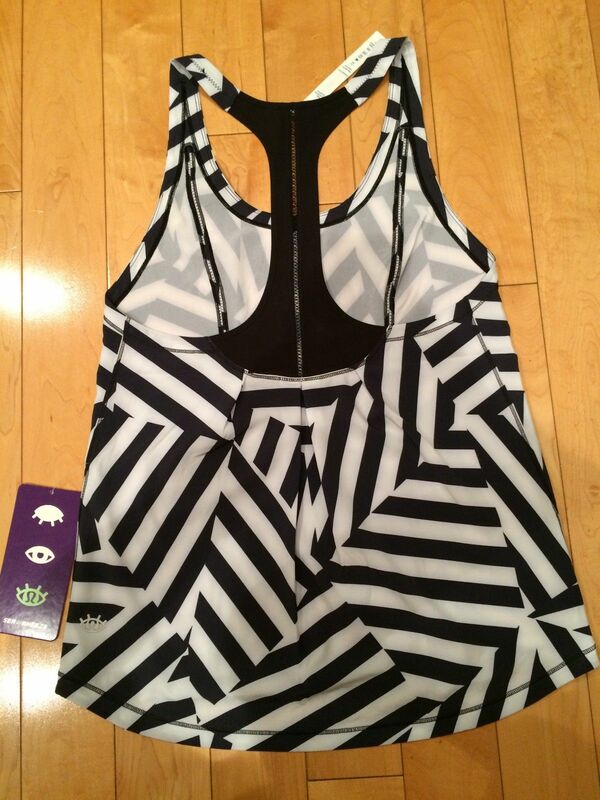 I've never bought any non-Seawheeze Lulu items from any bidding sites, as I'm just cringing re:paying jacked up aftermarket prices. 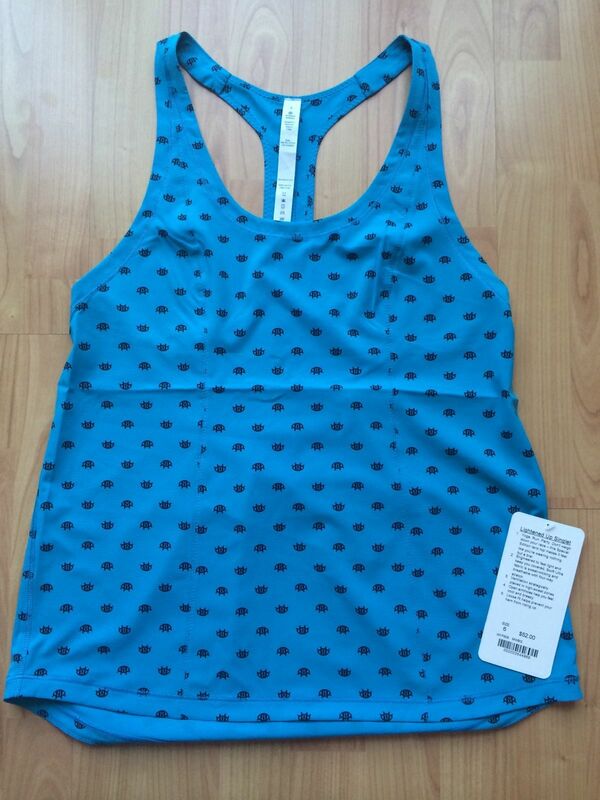 However, Seawheeze items' aftermarket price increases don't bother me at all. After all, I didn't have to pay nearly as much for these beauties as the gals who register, make the trip, pay for airfare, hotels, food, etc., and who then line up at the crack of dawn, wait for hour+ inline, race around for a hour+ trying stuff on and, for some, waiting around even longer for items they may have missed the first go round in the Seawheeze crazy retail store. 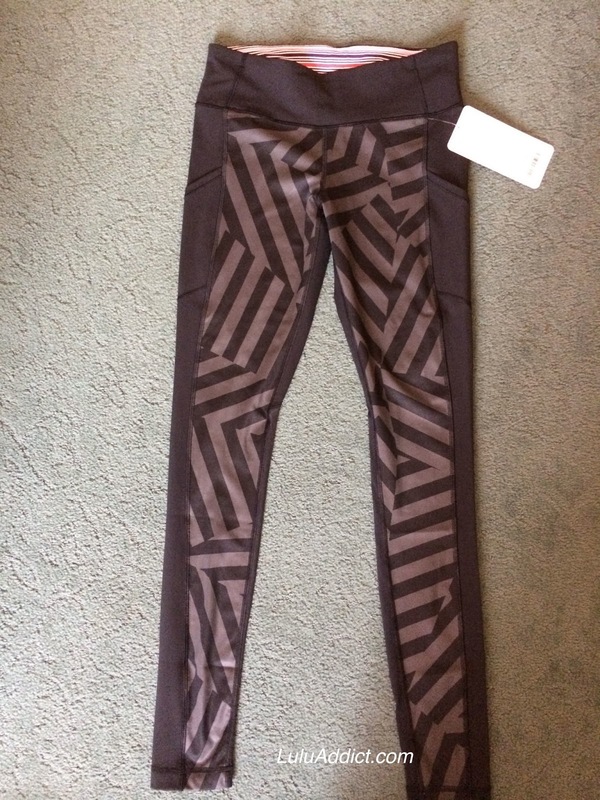 I'm sure I'll run Seawheeze one day soon, when my wee girls are a bit older, but for now I'm very pleased to purchase my fav Seawheeze items on bidding sites after it's over, from the comfort of my home with a cup of coffee (or red wine!) in hand. Can't wait to load up my Keep On Running Duffel & take her to class tomorrow. 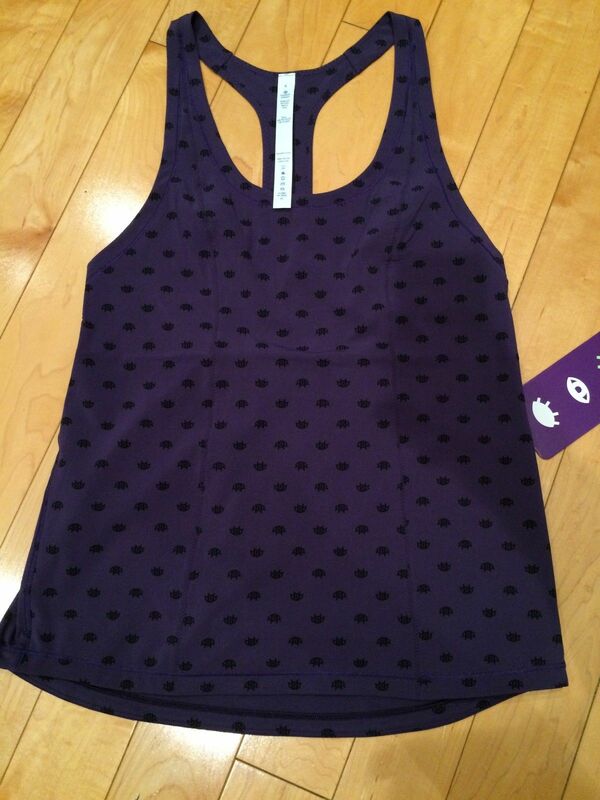 Britt's Picks - Bumble Berry Cool Racerback!